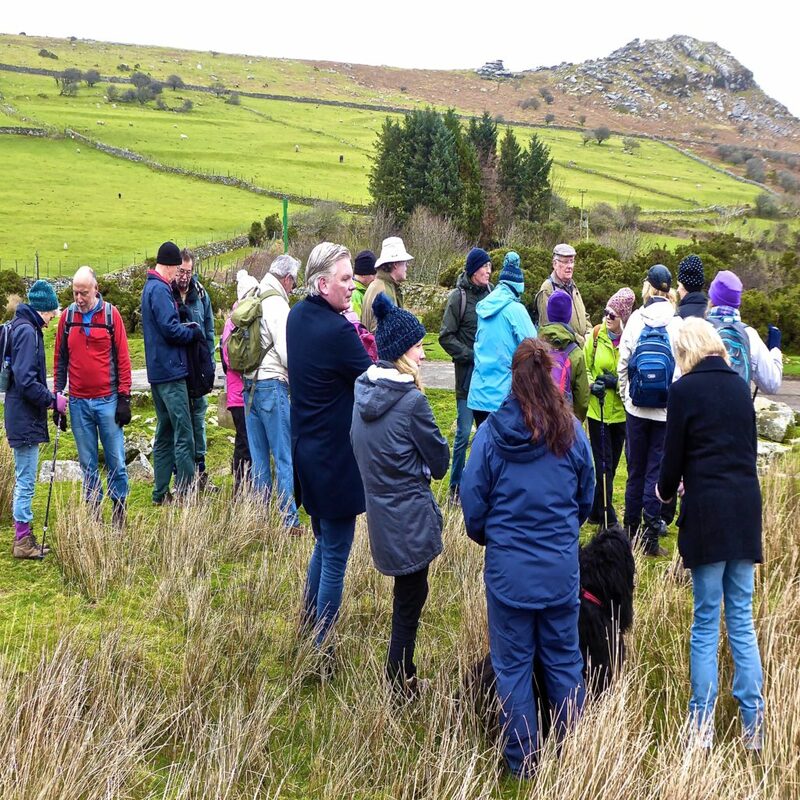 Iain Rowe and Brian Oldham led the annual walk in memory of Bo Foaks, who was a keen walker, a folk musician and a lover of Bodmin Moor. 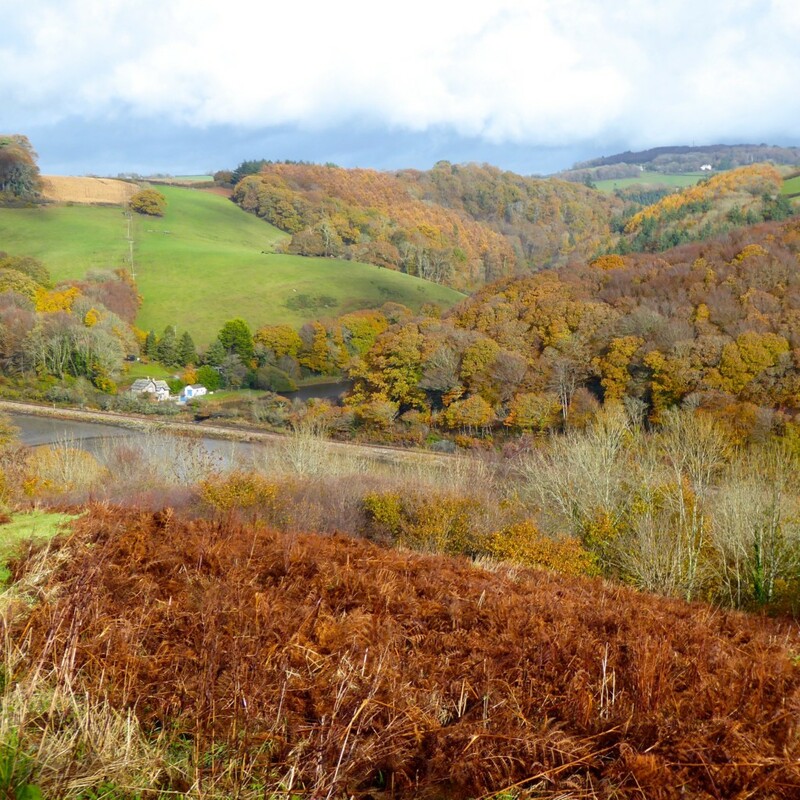 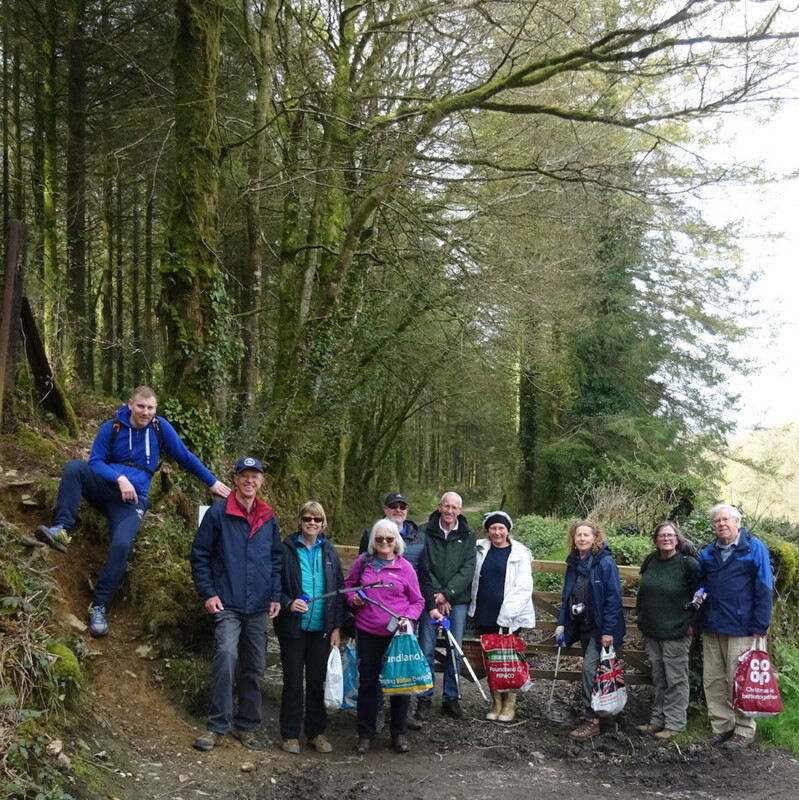 The group walked from Stuart House to Treworgey, Highwood and the track of the old Liskeard & Caradon Railway. 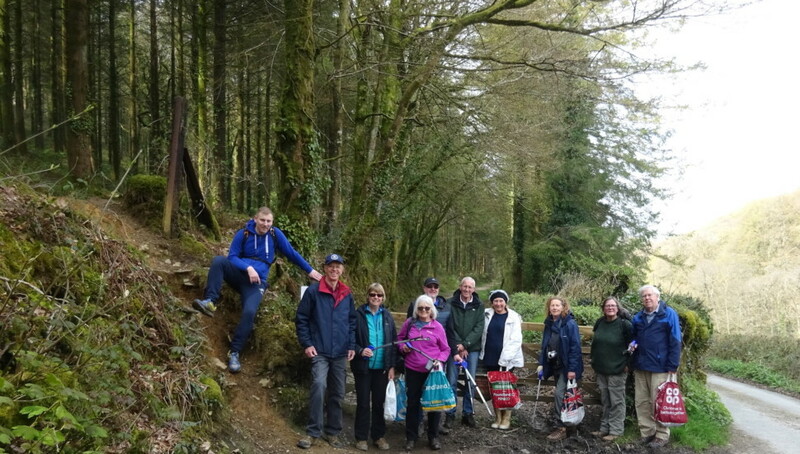 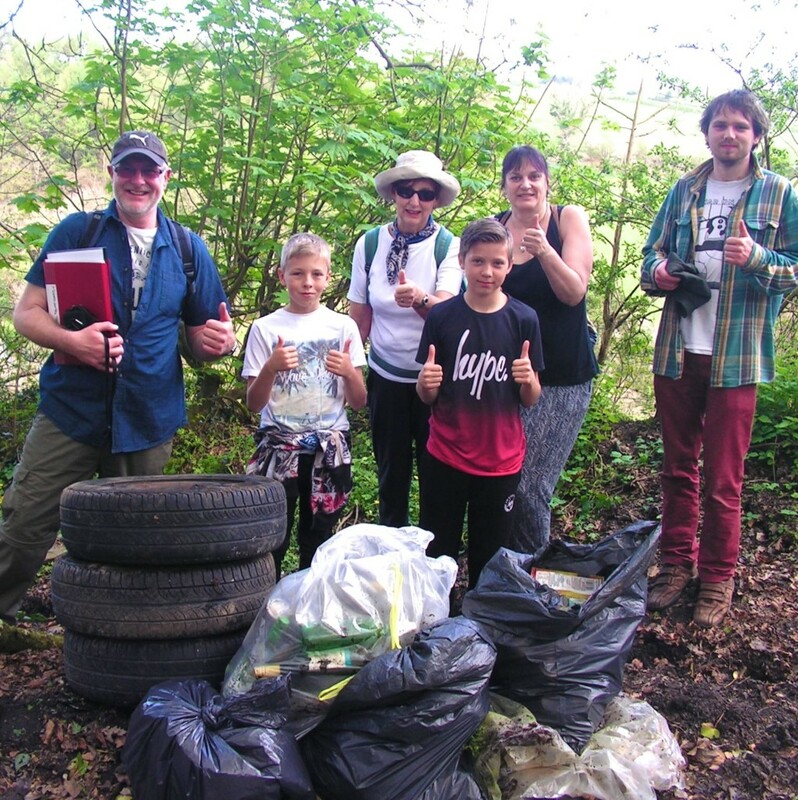 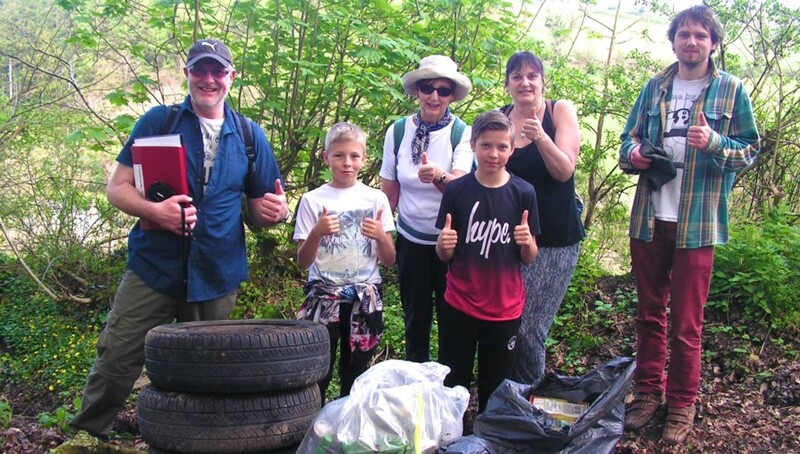 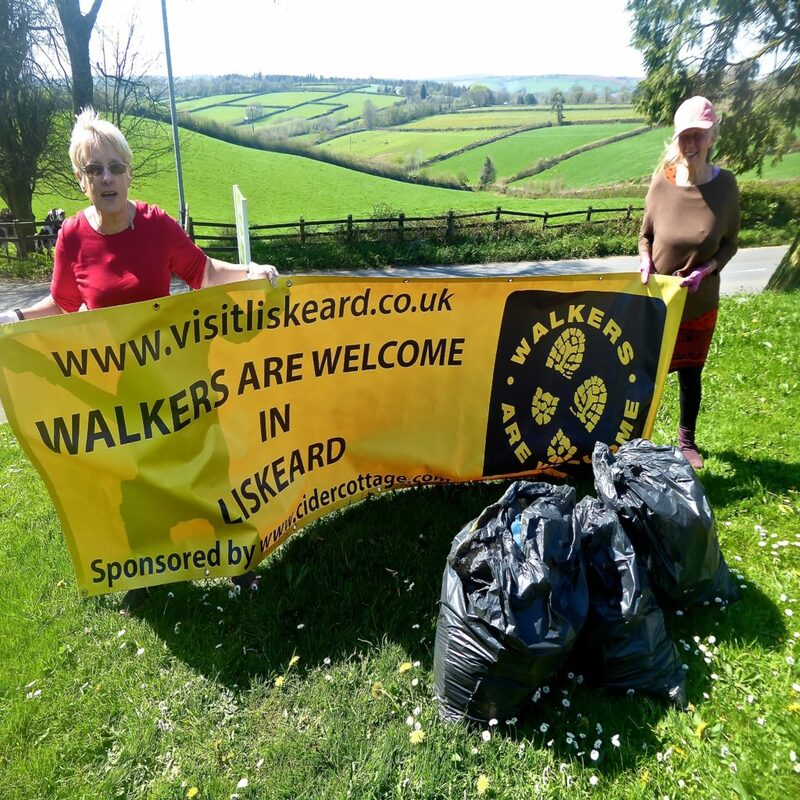 As the walk coincided with a litter picking day in Liskeard, the walkers brought litter-pickers and bags and tidied the lanes and hedgerows as they went. 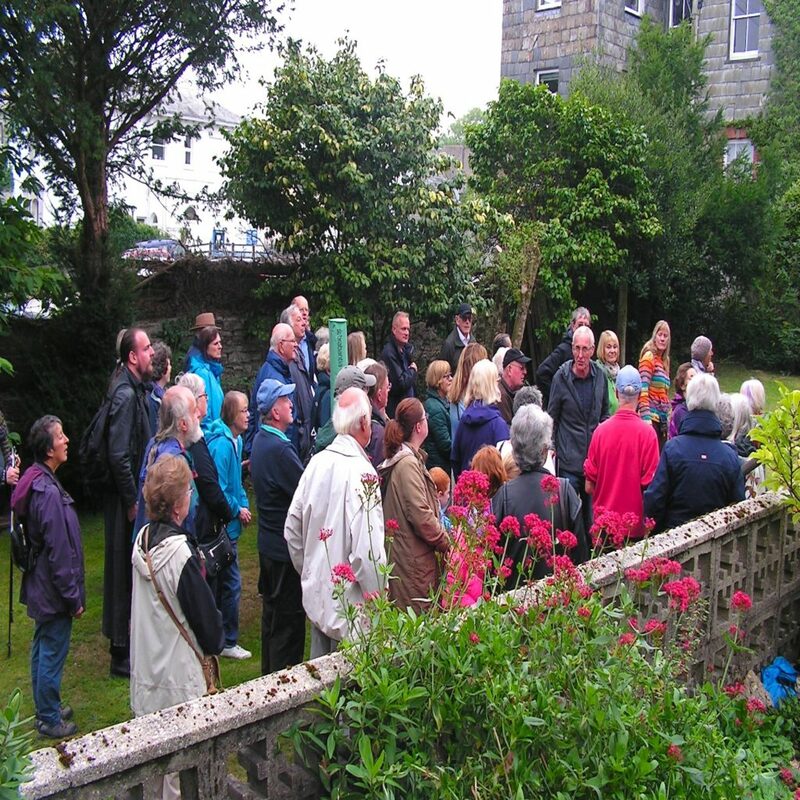 Afterwards, everybody appreciated the soup lunch provided by the volunteers at Stuart House. 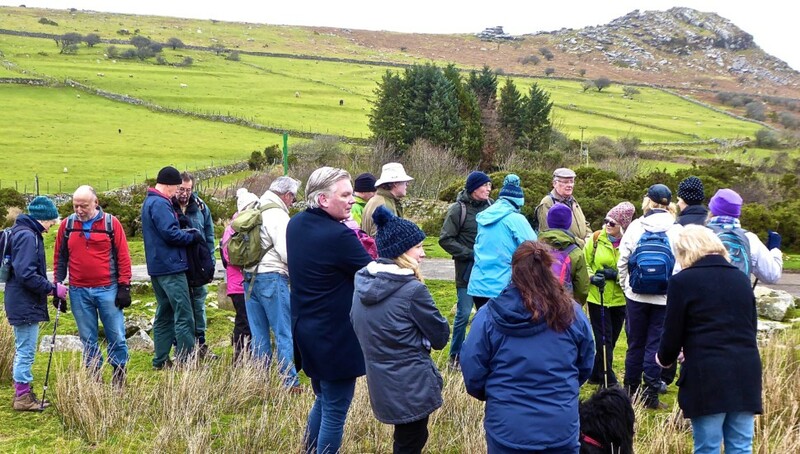 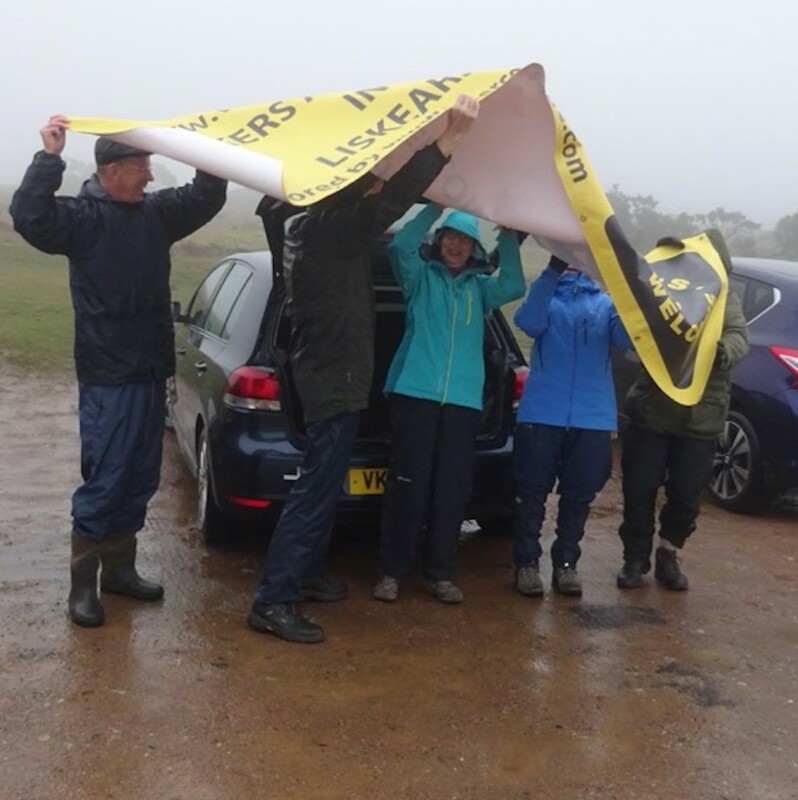 Despite weather warnings of 50 mile an hour gales, the intrepid Walkers are Welcome group braved the elements to celebrate the 6th Anniversary of the Caradon Trail. 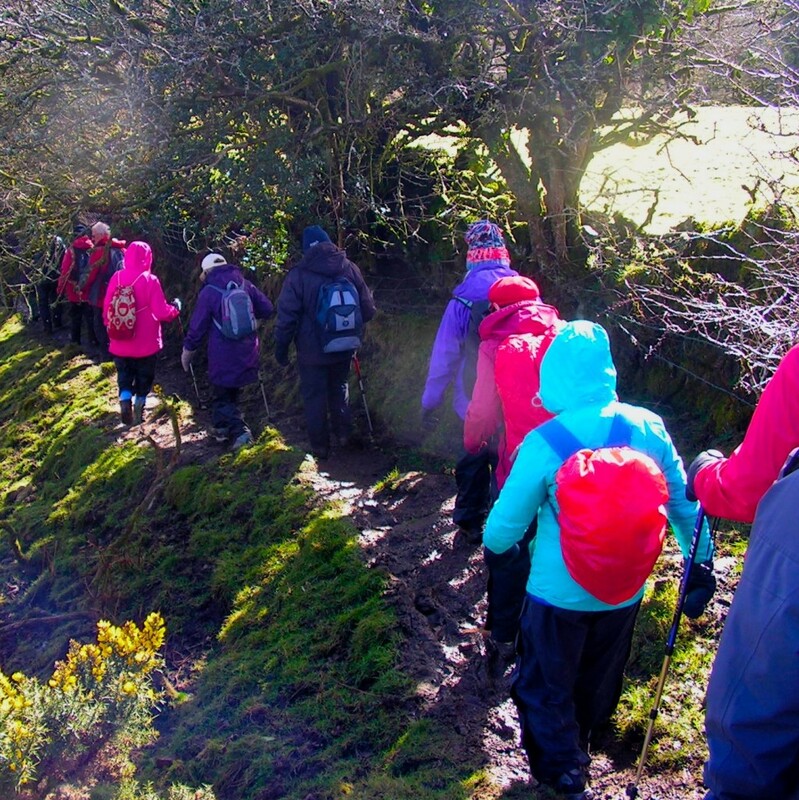 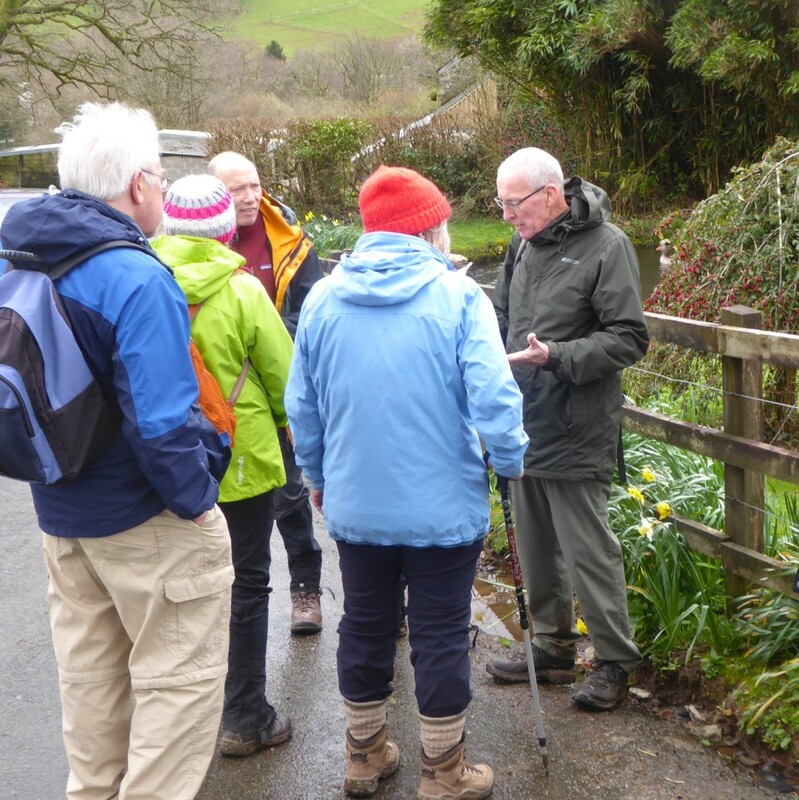 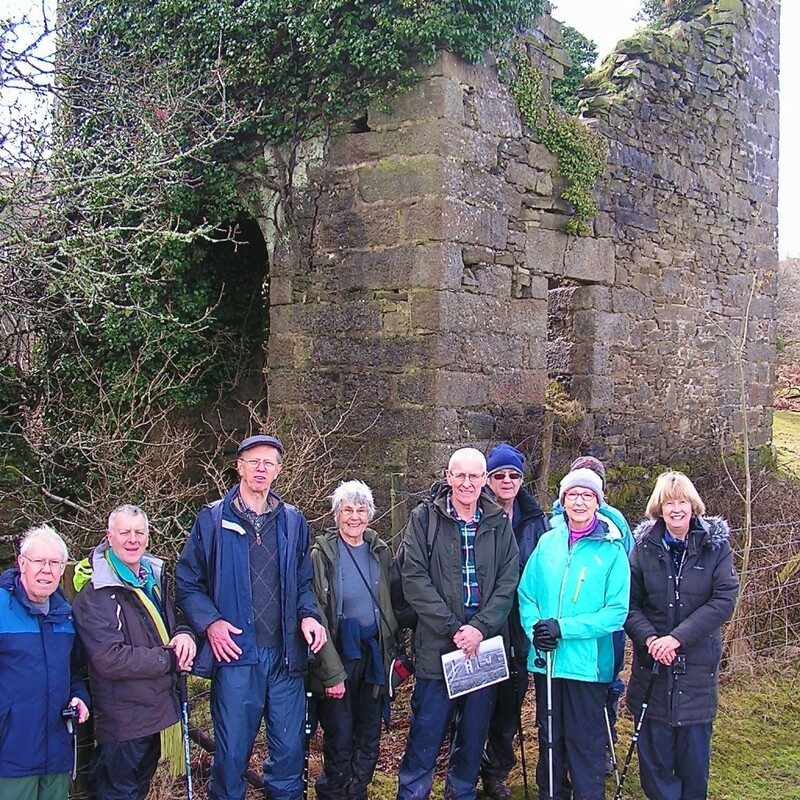 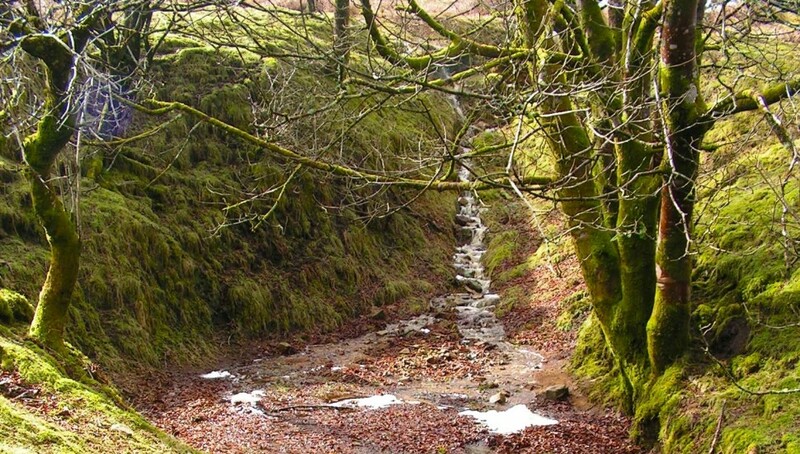 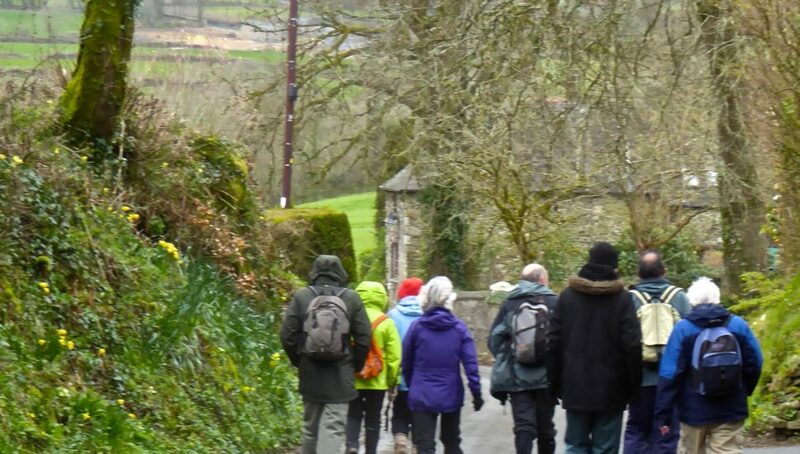 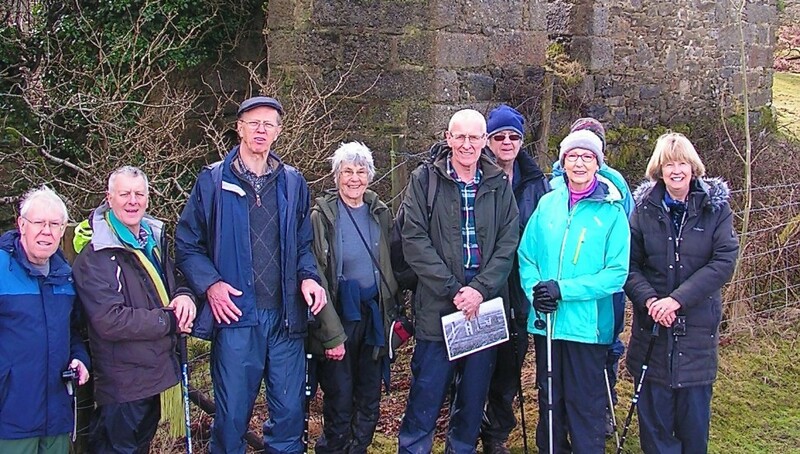 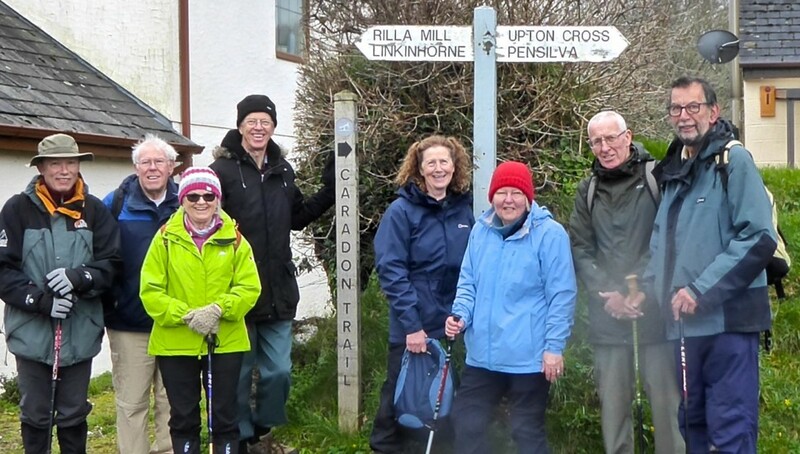 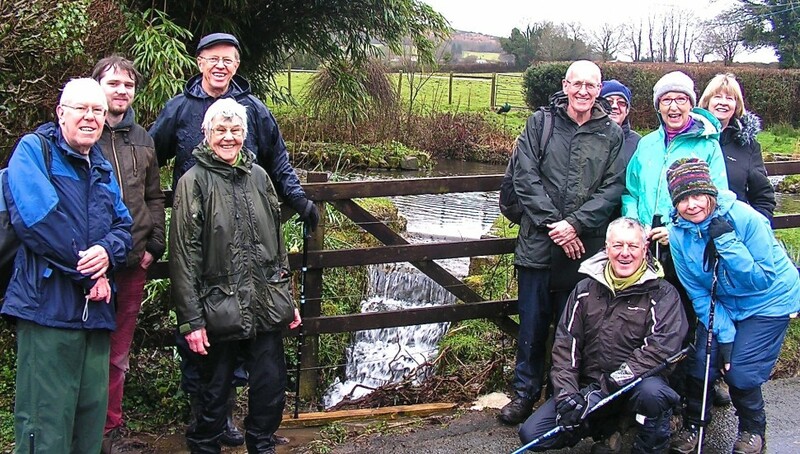 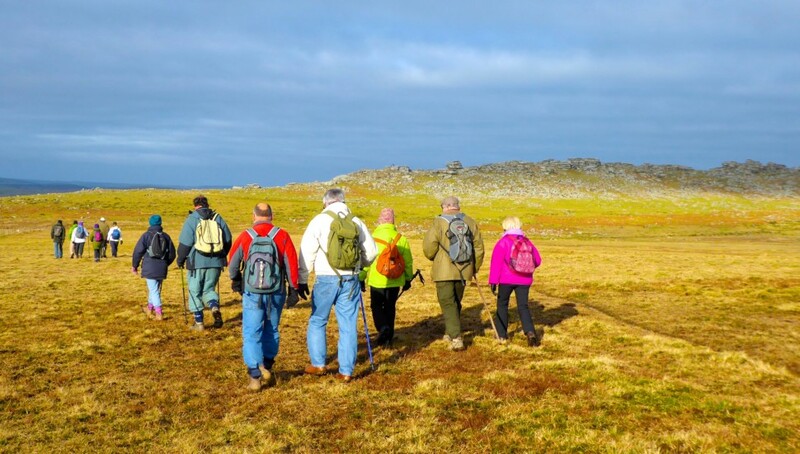 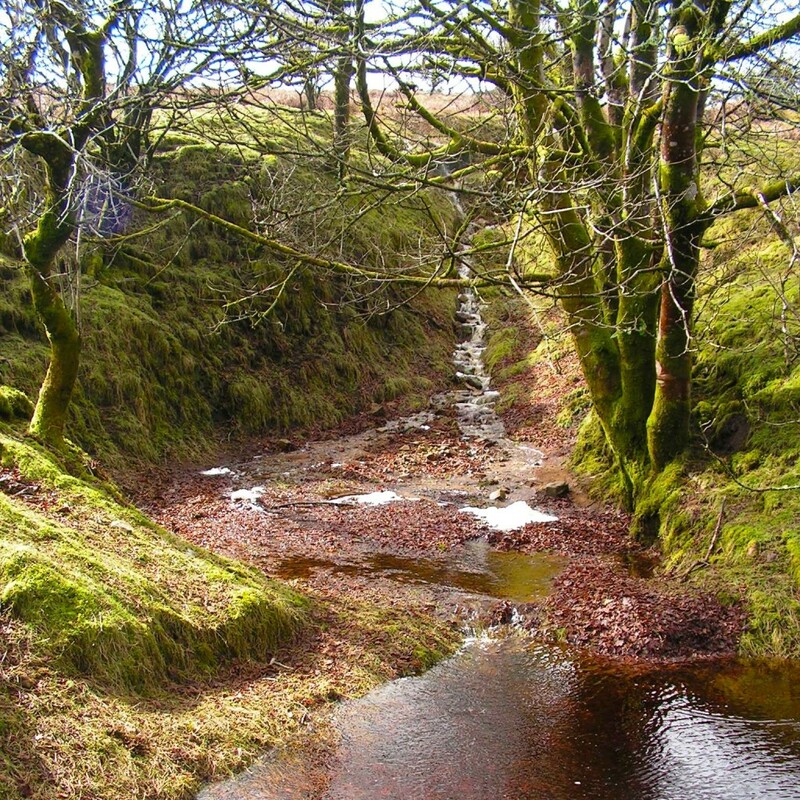 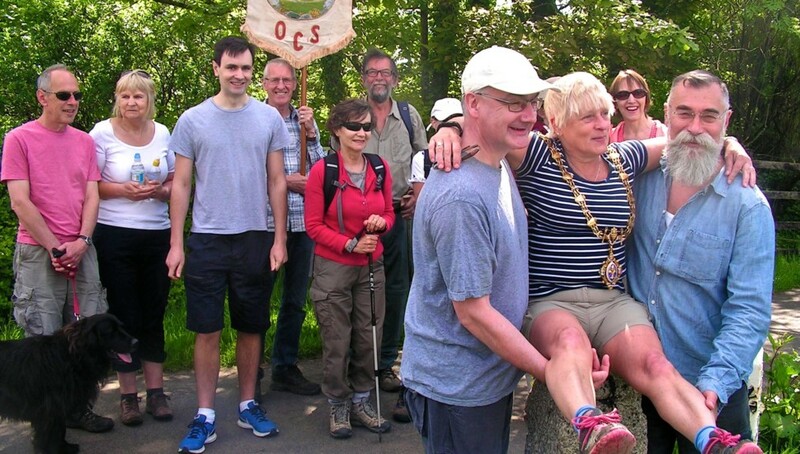 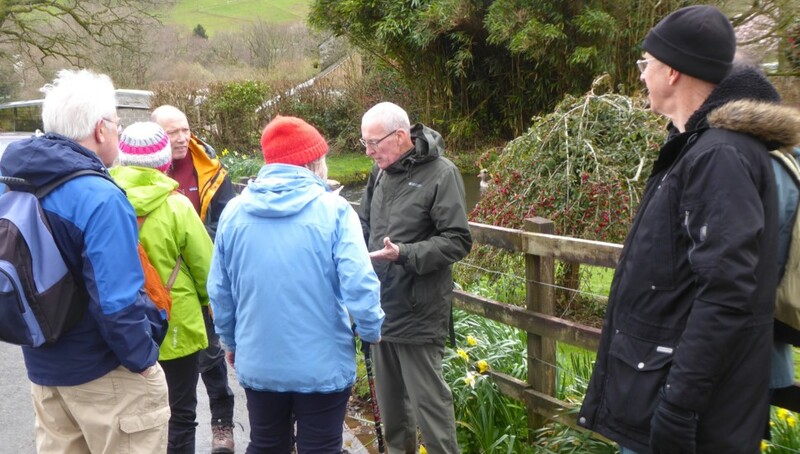 Each year Brian Oldham has led a circular walk of about 5 miles taking in a part of the trail, and this time the group explored hills and valleys around Upton Cross, Rilla Mill and Caradon Town. 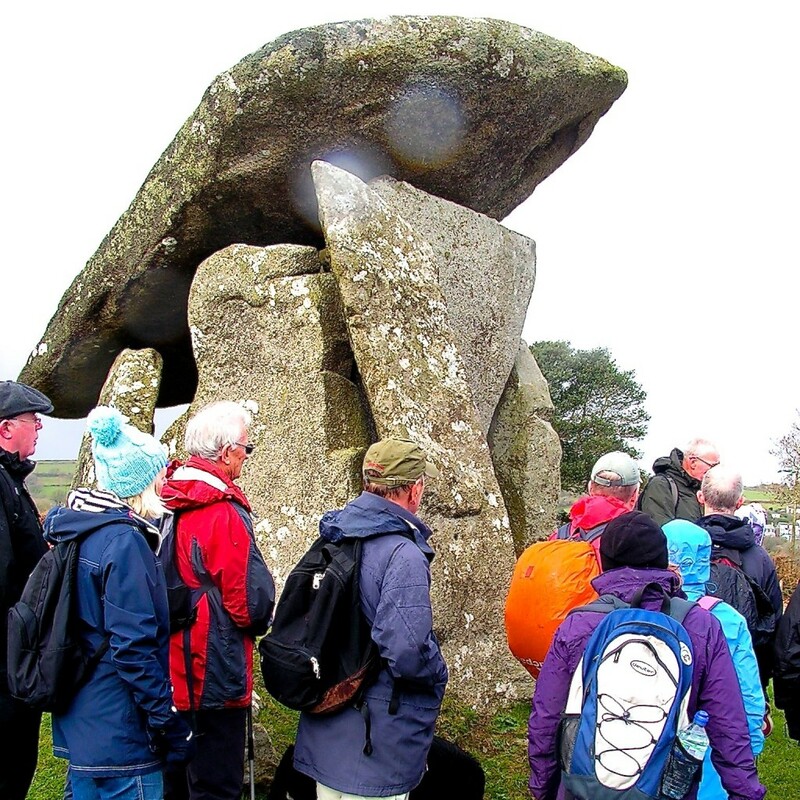 The outlines of Sharp Tor, Cheesewring, and Caradon were ever-present against a threatening sky, but the rain held off, and historical anecdotes, geese stopping traffic, and the wonderful yellow of hedgerow primroses and daffodils cheered the day! 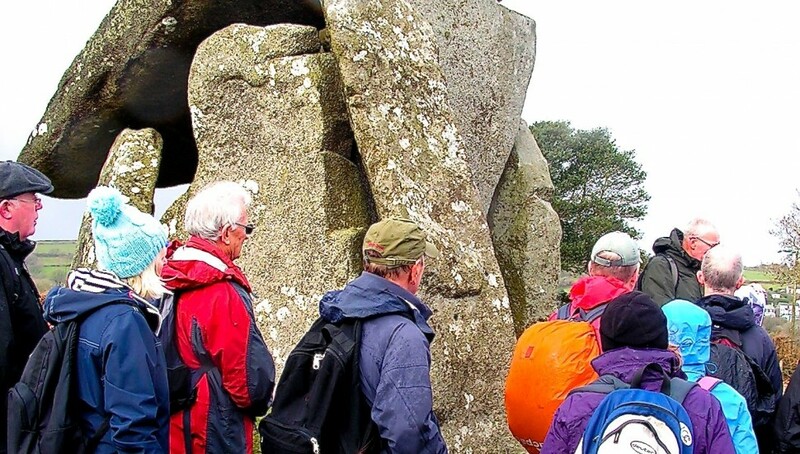 New Years day saw about 20 of us leaving our cosy fire-sides for an invigorating walk around Sharp Tor on Bodmin moor whilst searching for, and learning about boundary stones under the expert eye of Brian Oldham. 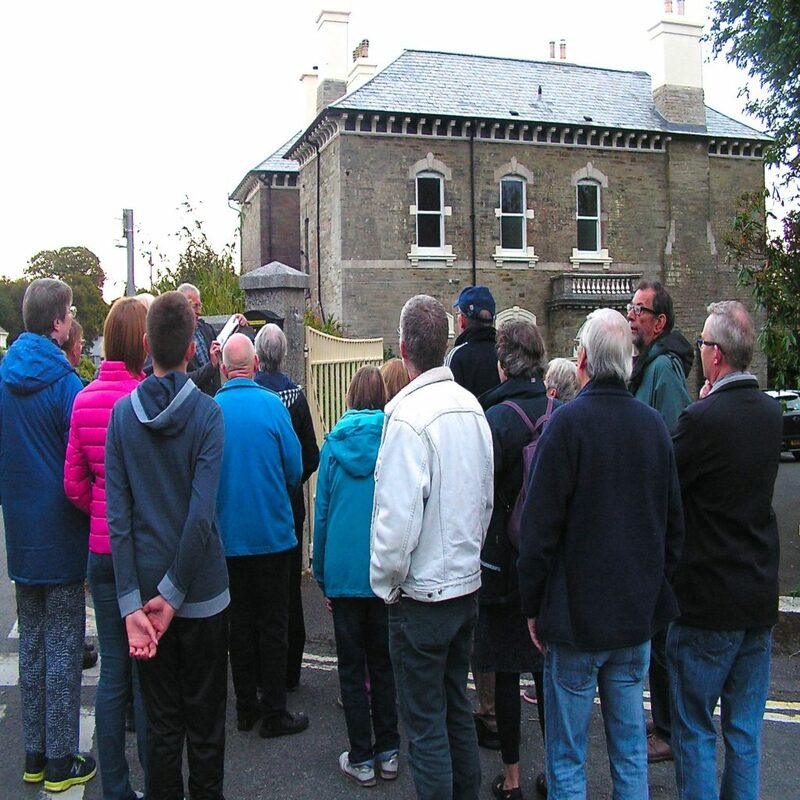 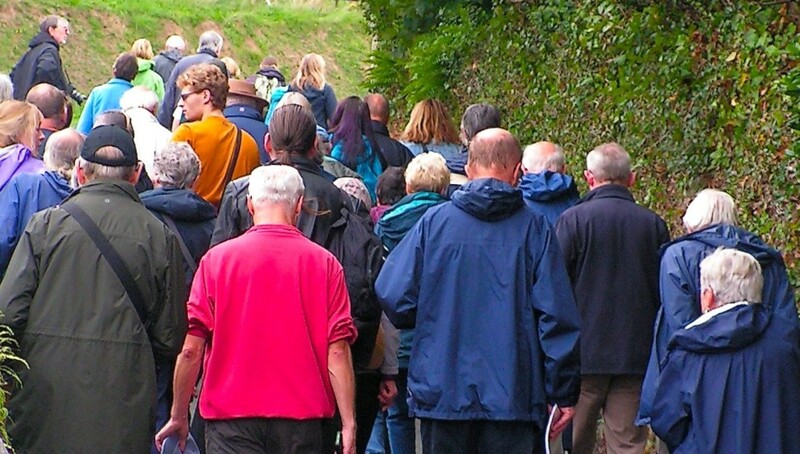 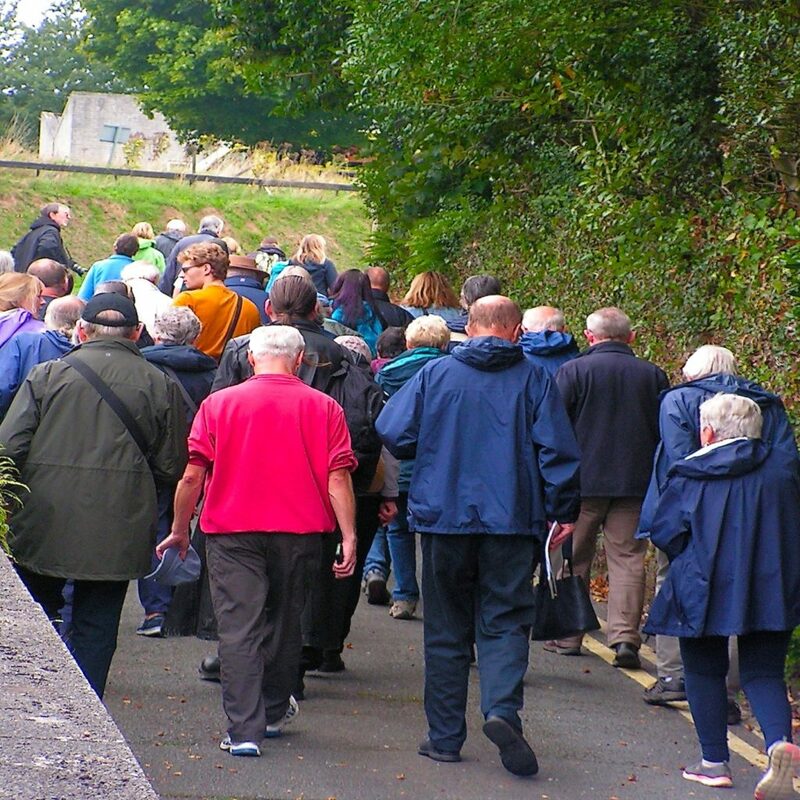 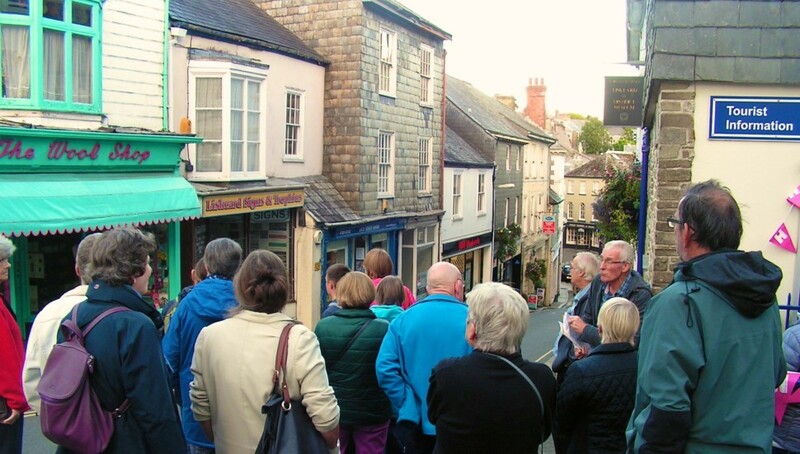 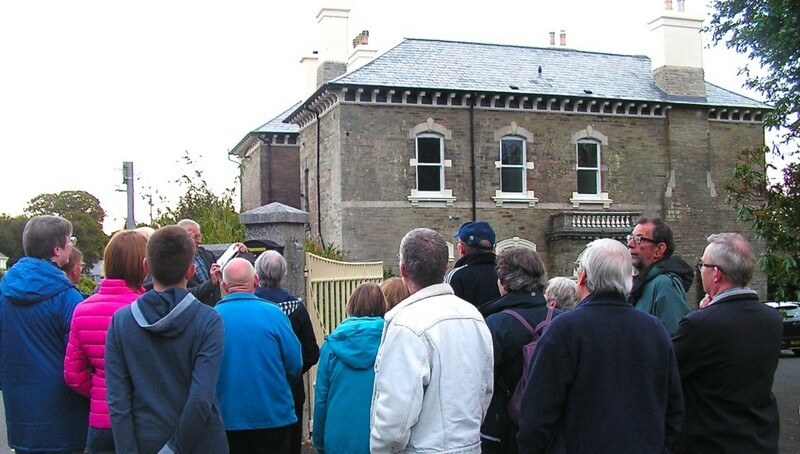 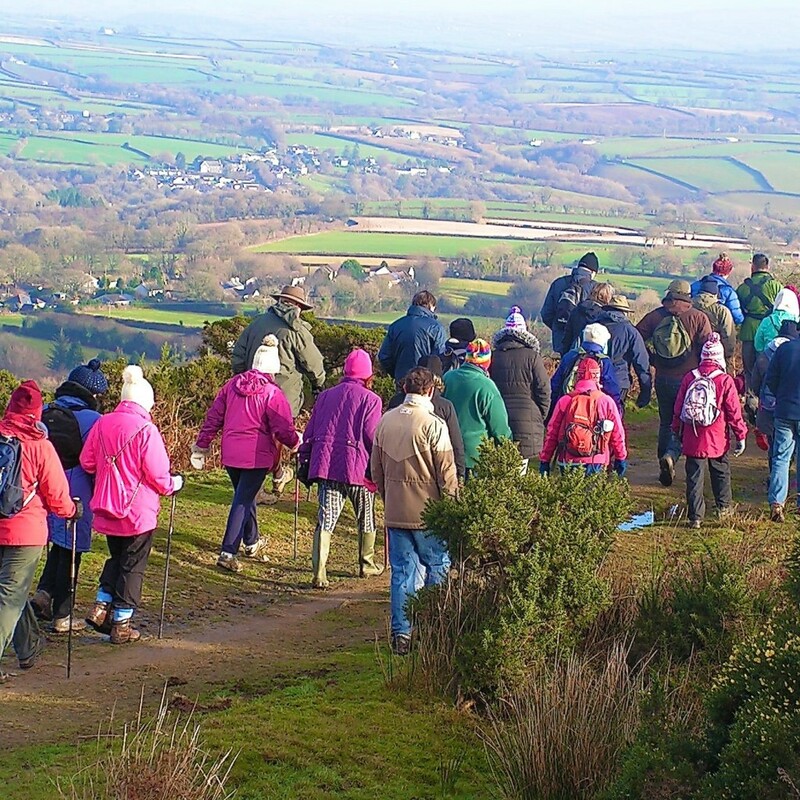 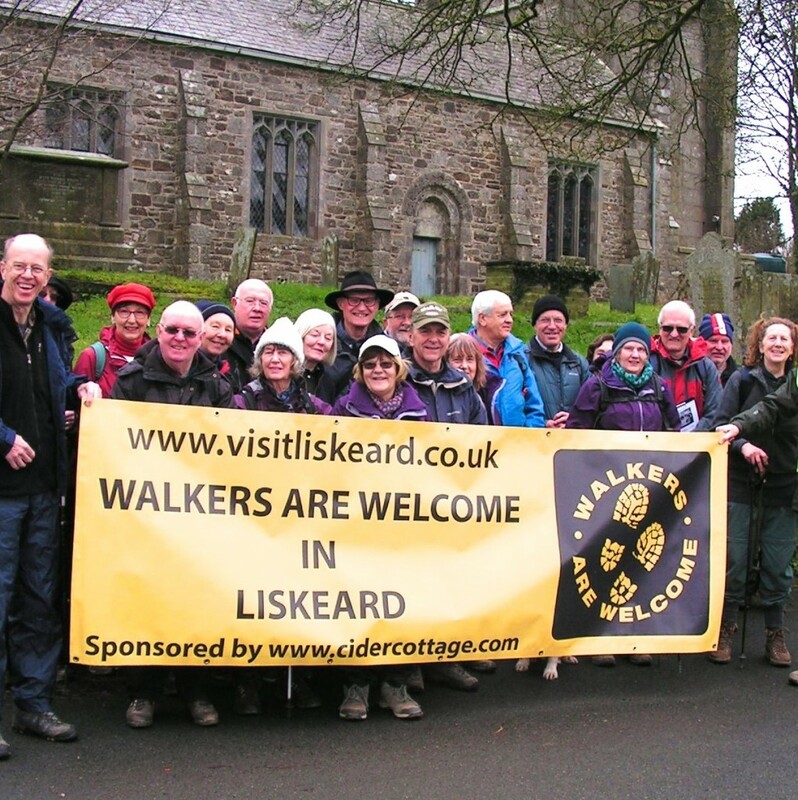 Walkers are Welcome supported the extremely successful ‘Liskeard Unlocked’ event with two very popular walks and talks around the historic buildings and alleyways (‘drangways’) of the town. 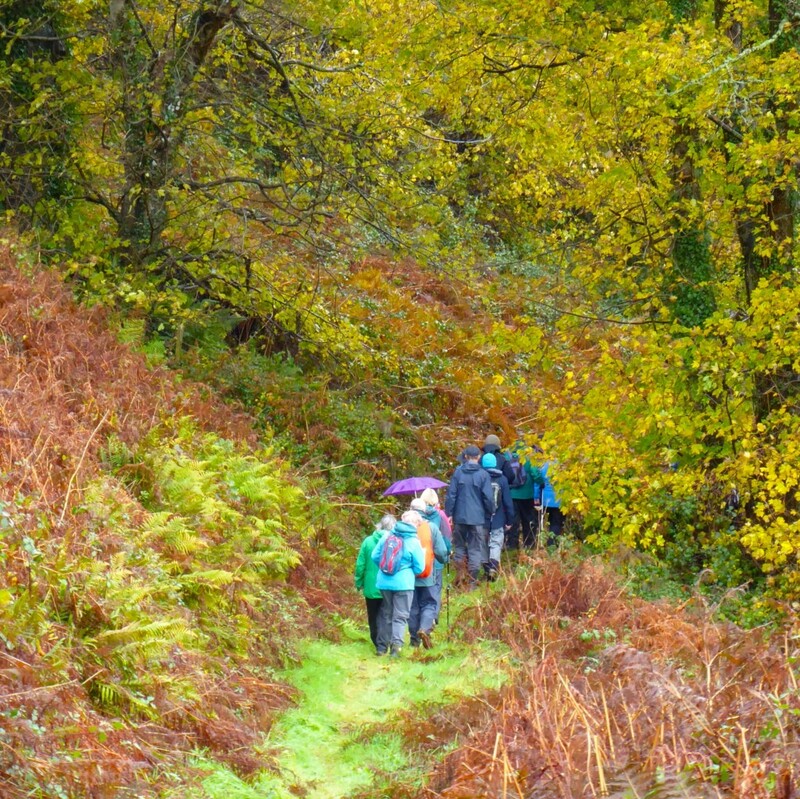 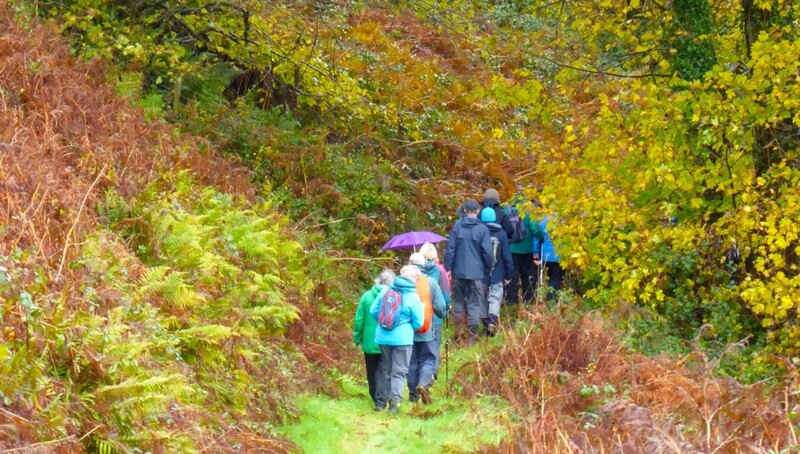 Our walk leaders Brian and Jill have organised regular walks for health from the two surgeries in Liskeard which are well attended, and once again Walkers are Welcome took part in the South East Cornwall walking festival, as well as members supporting other local walking groups – a highlight was seeing the stunning autumn colour in Trenant woods with the Caradon group. 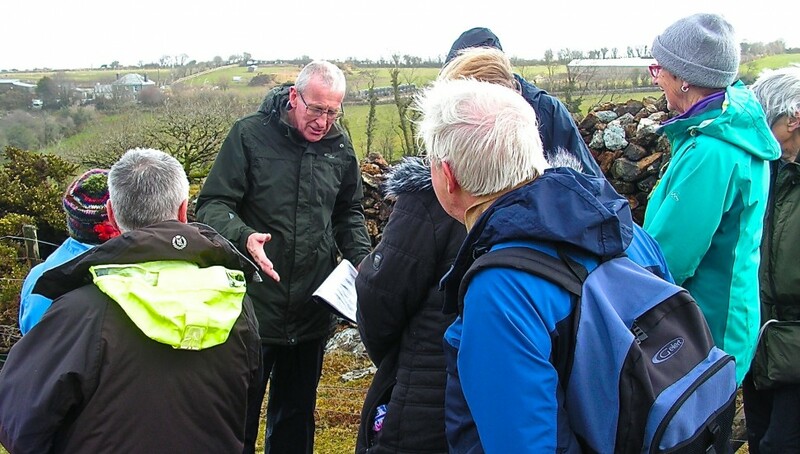 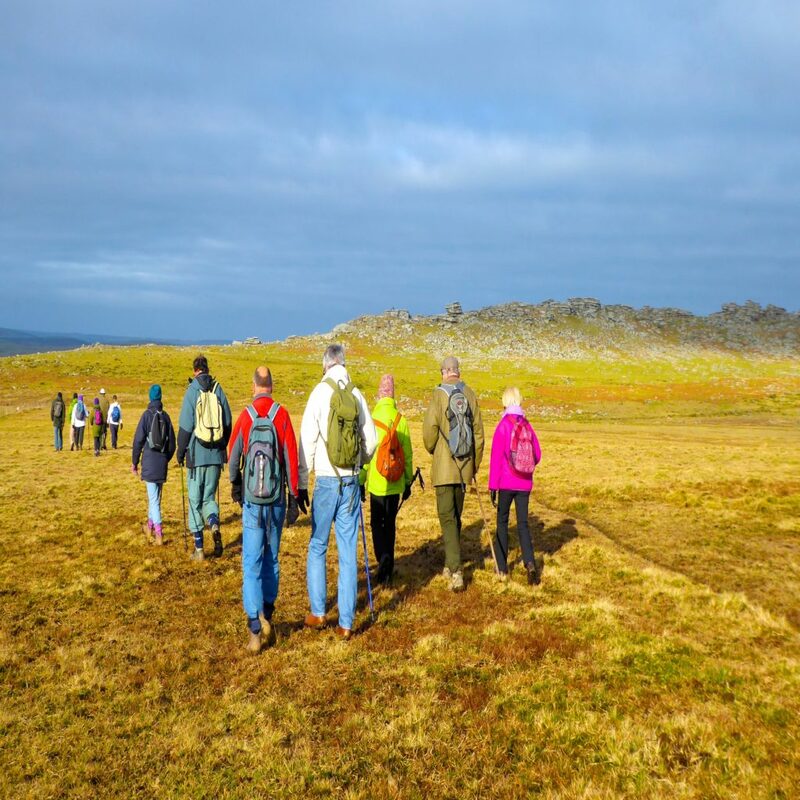 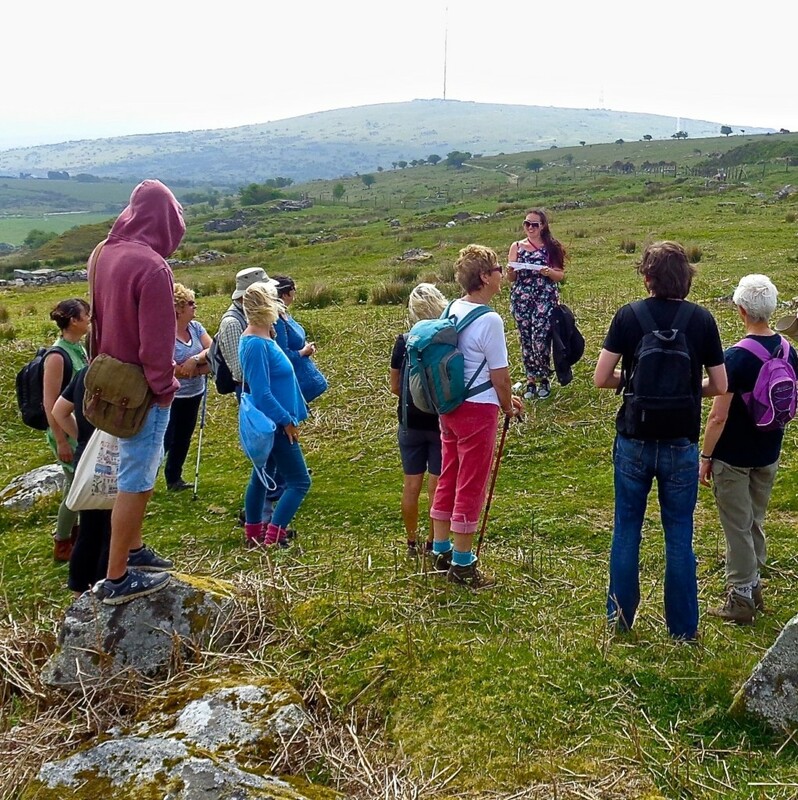 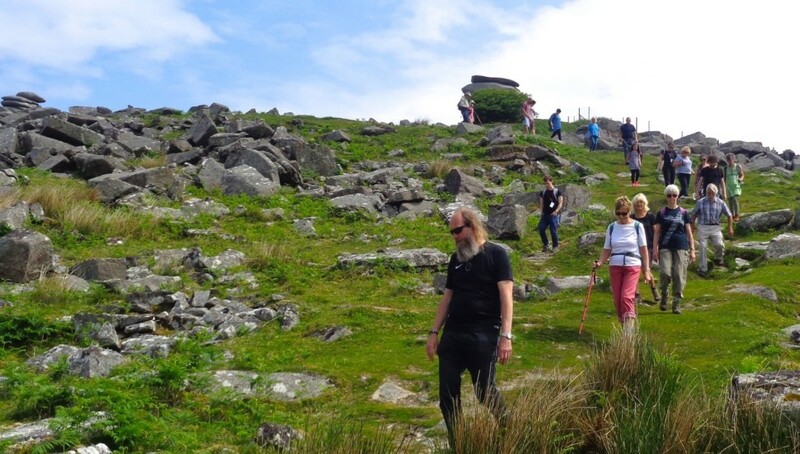 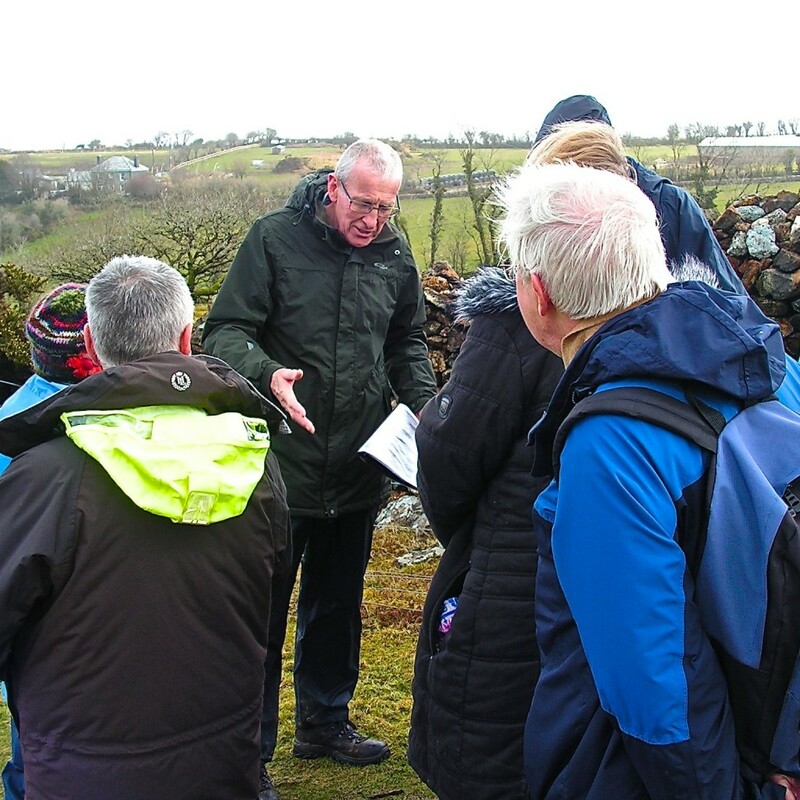 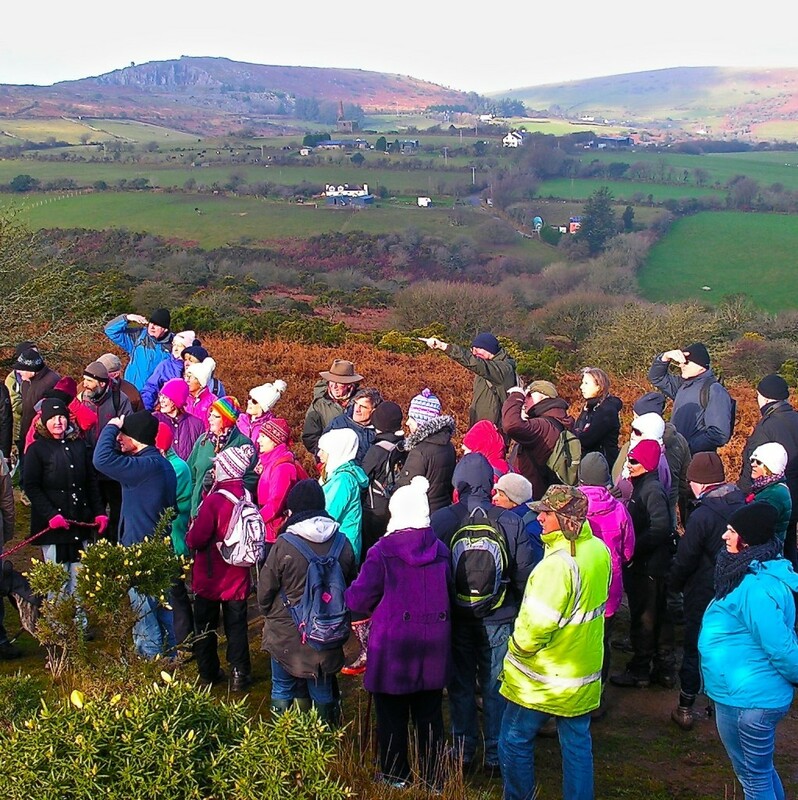 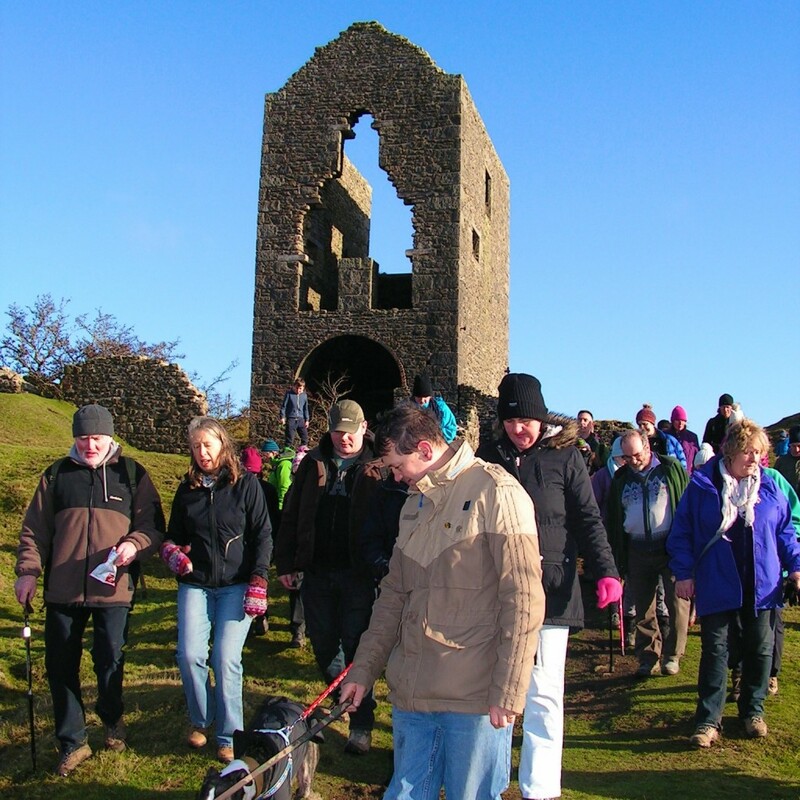 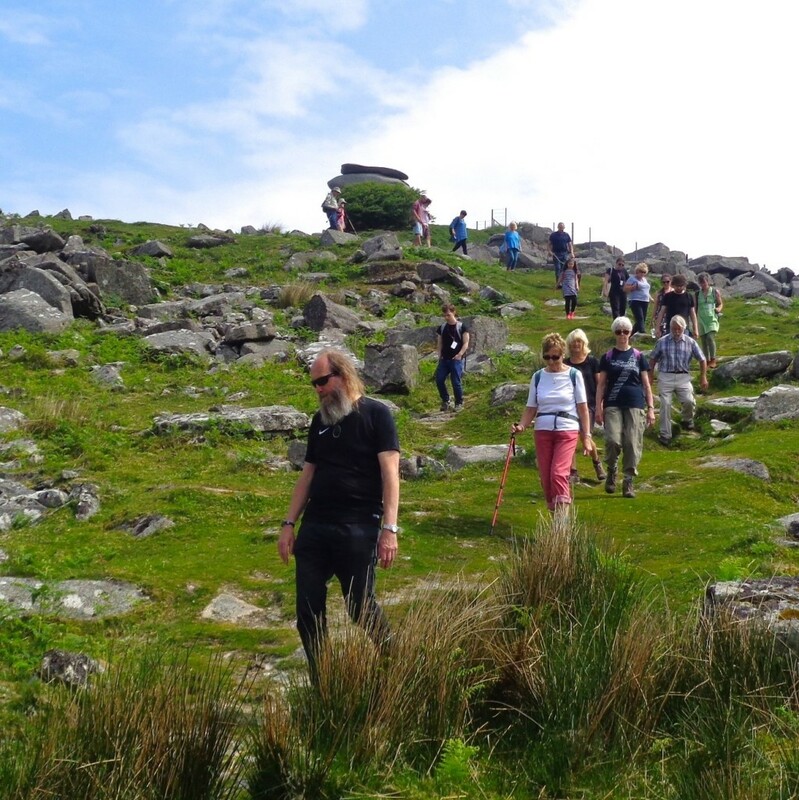 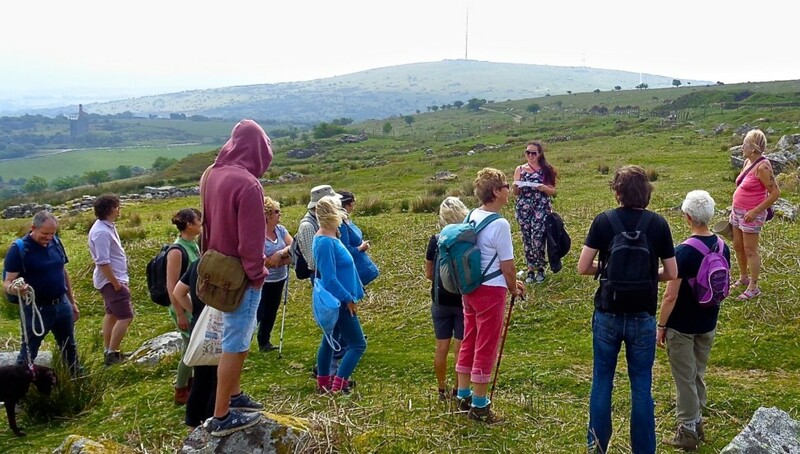 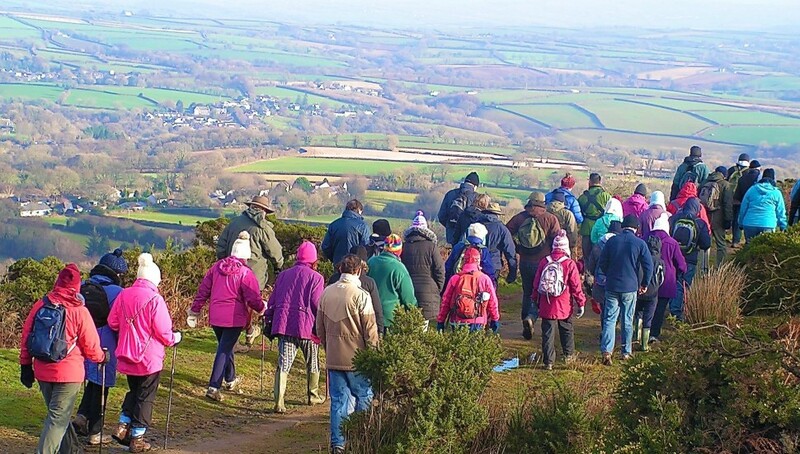 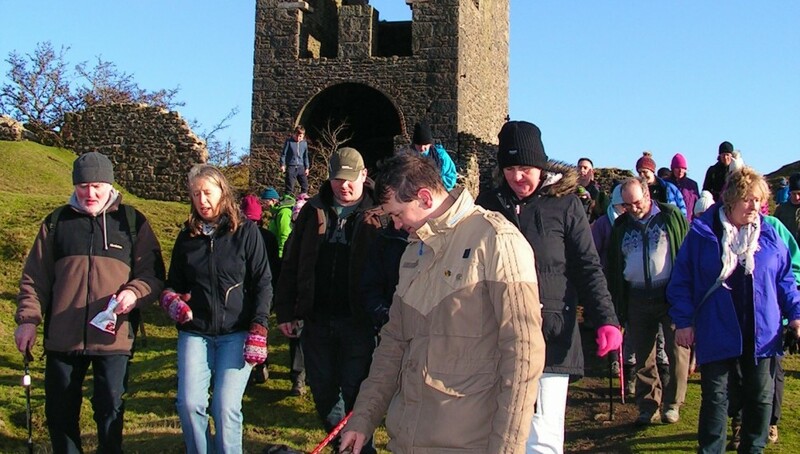 Our WaW leader Brian Oldham led another very successful walk for the Bodmin moor poetry festival. 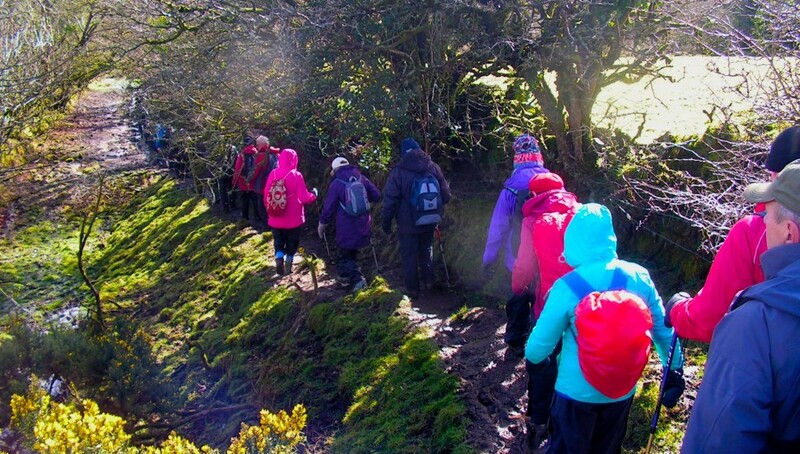 With good weather, stunning views and inspiring words along the way, it all made for a memorable day! 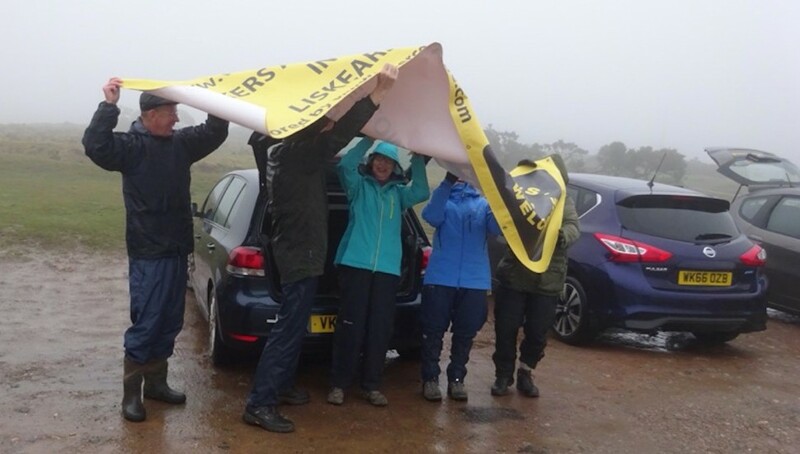 A support vehicle helped with bags and the all important picnic lunch, and also enabled some people to do part of the circuit so they could share in this community event. 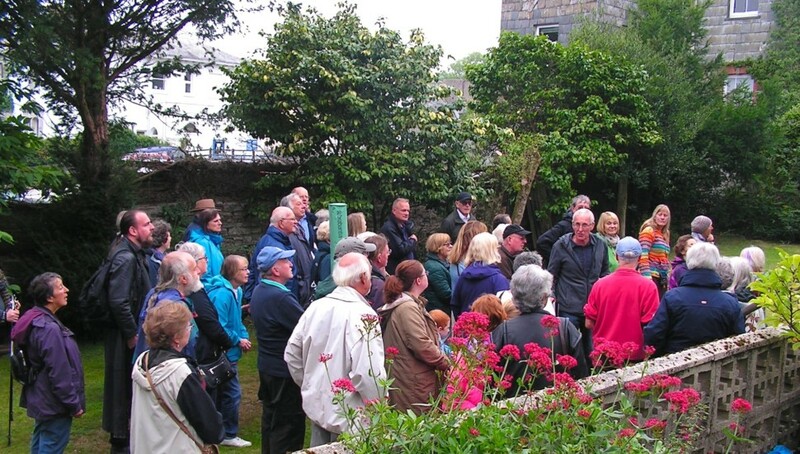 Some of our WaW group joined the early summer guided walks to promote the new ‘Cornish Celtic Way’ – a pilgrimage route through Cornwall with a useful book that can be purchased & online information showing route maps and themed sections which tell the story of places along the way, including the history of the celtic saints & their influence and heritage in the landscape. 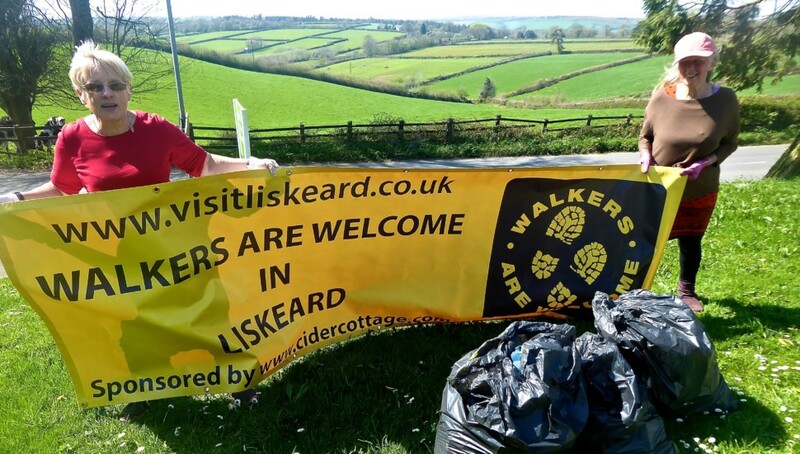 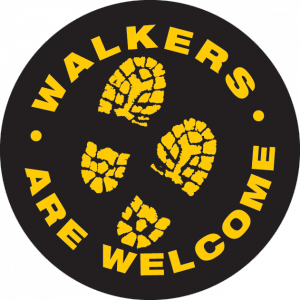 Walkers are Welcome members supported the Liskeard litter pick when they joined the Stuart House memorial walk to Moorswater and found some rubbish along the way, as well as tidying up around the popular Coldstyle/ Culverland road walking circuit. 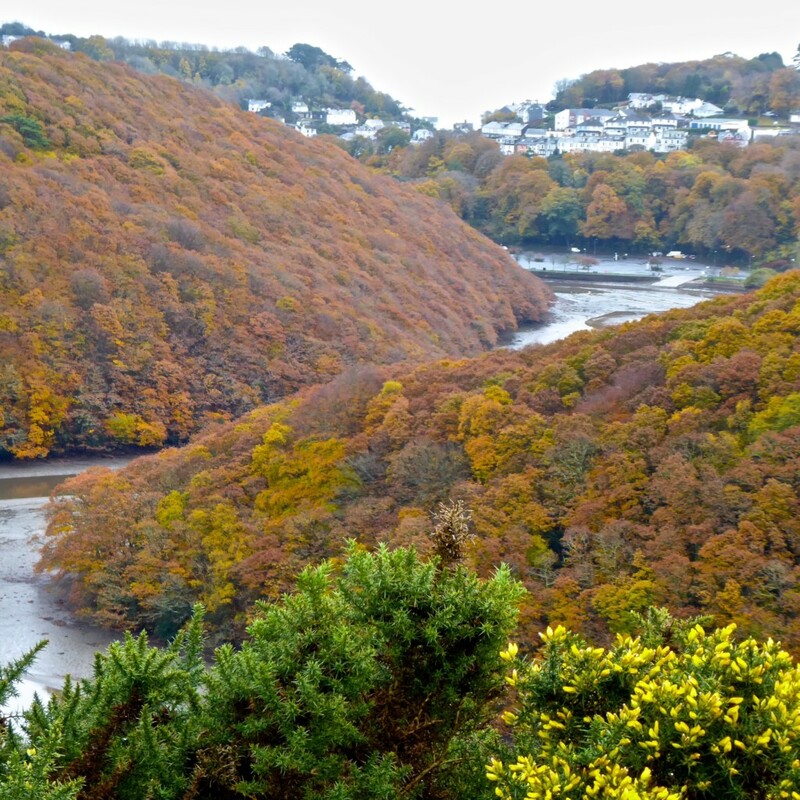 Yes we definitely get our fair share of rain in Cornwall!! 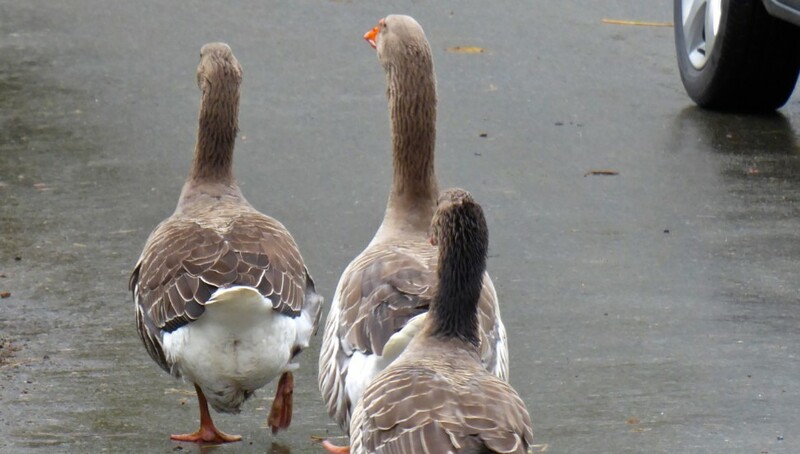 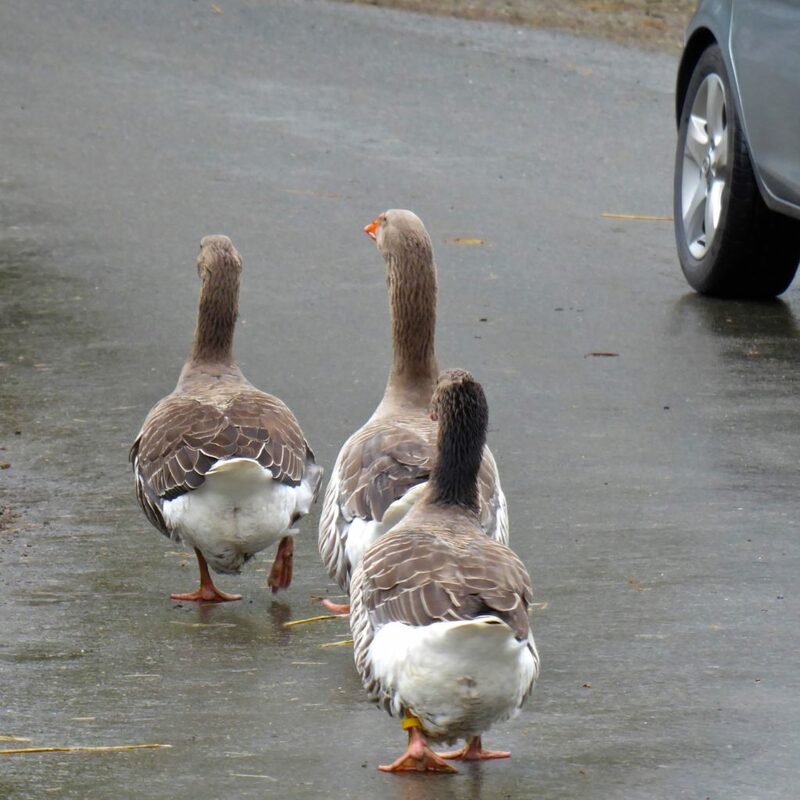 This amusing photo taken by one of our members was also the winning entry in a local community photographic competition. 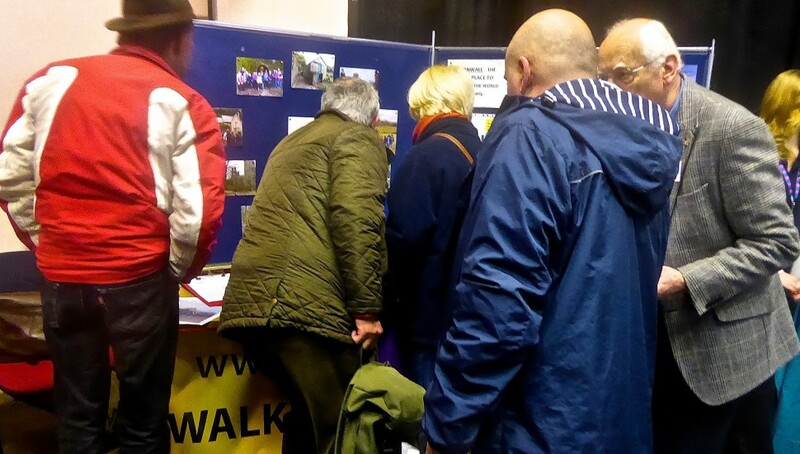 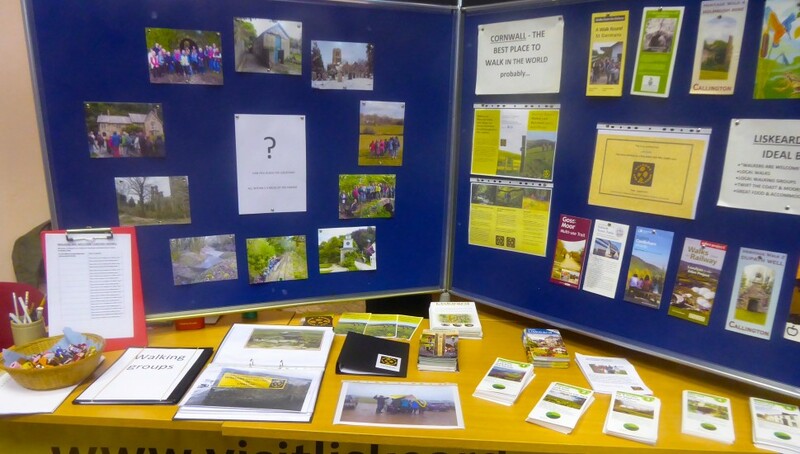 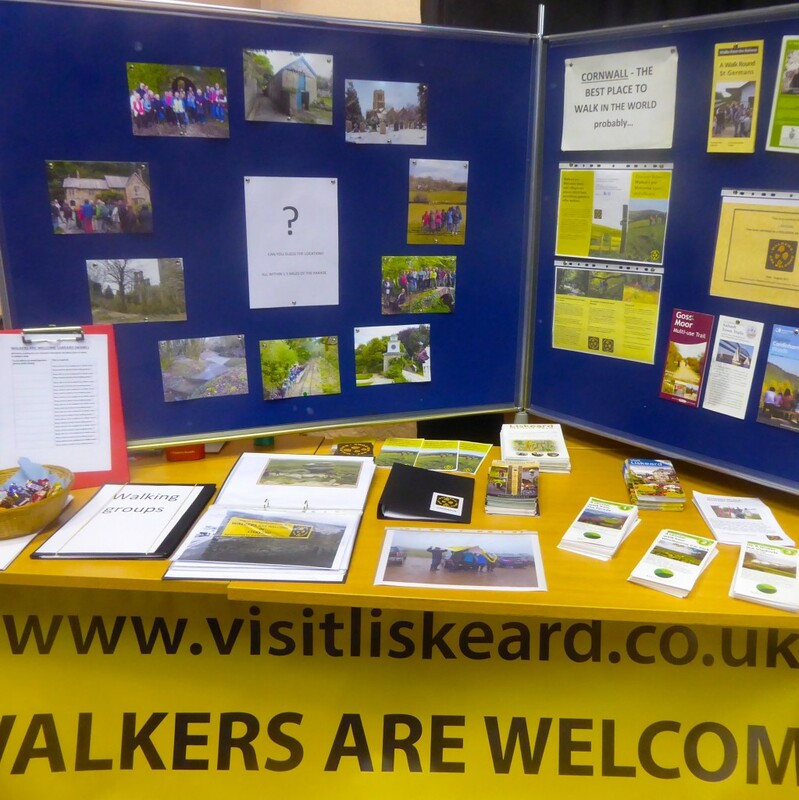 Liskeard Spring Community Fair saw the Town Hall packed with stalls representing local charities, voluntary organisations and community groups, with hundreds of people coming through the door to find out what goes on, and how they can get involved. 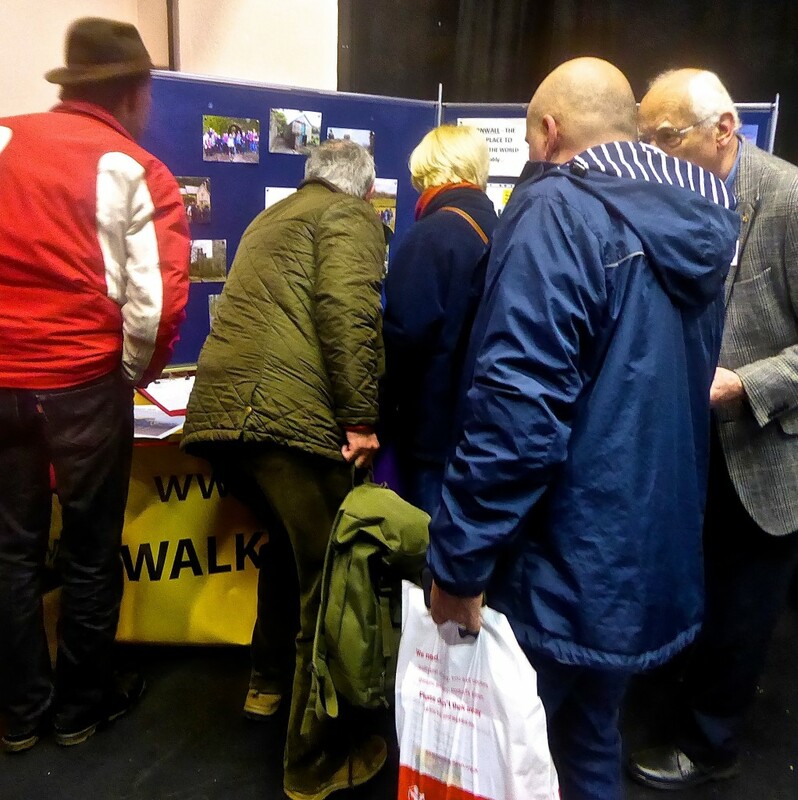 There was a real buzz at the Walkers are Welcome stall with great interest in our ‘Name the local landmarks’ competition – edible prizes were definitely an added attraction! 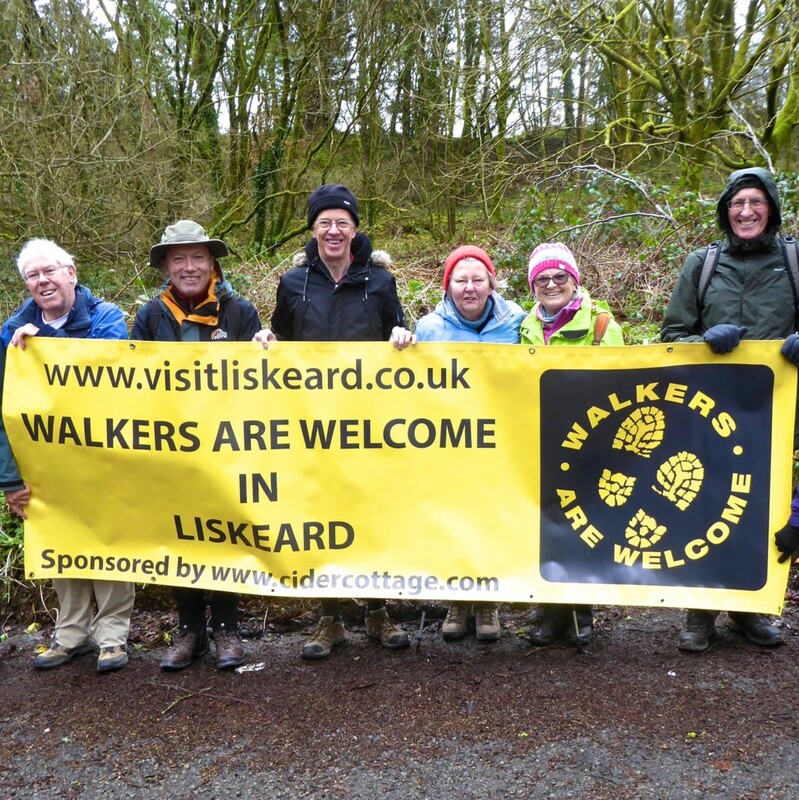 Despite the poor weather conditions, a hardy band of walkers celebrated the 5th Anniversary of the opening of the Caradon Trail, with a 5 mile hike organised by Liskeard’s Walkers are Welcome group and led by Brian Oldham, taking in part of the World Heritage Site around Tokenbury and the Marke Valley. 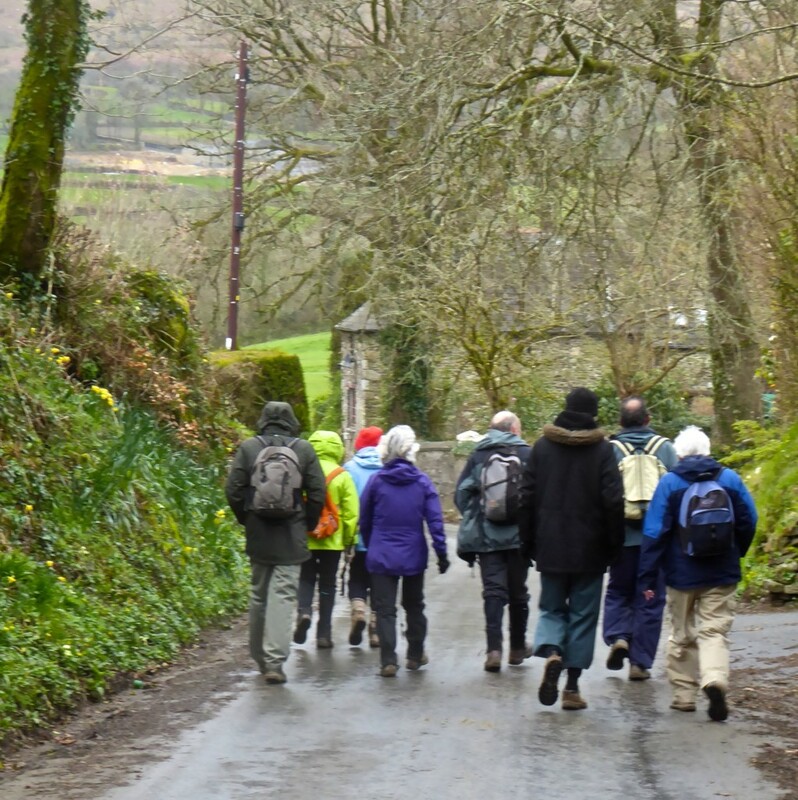 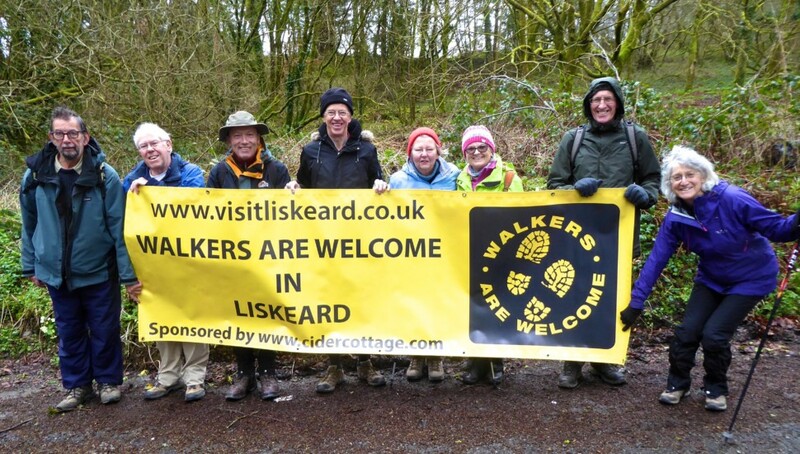 As the mist lifted and the rain clouds departed the walkers enjoyed the views as well as seeing remains of our local mining past and hearing insightful anecdotes of life in the industrial 1800’s, which brought prosperity to Liskeard and the surrounding area. 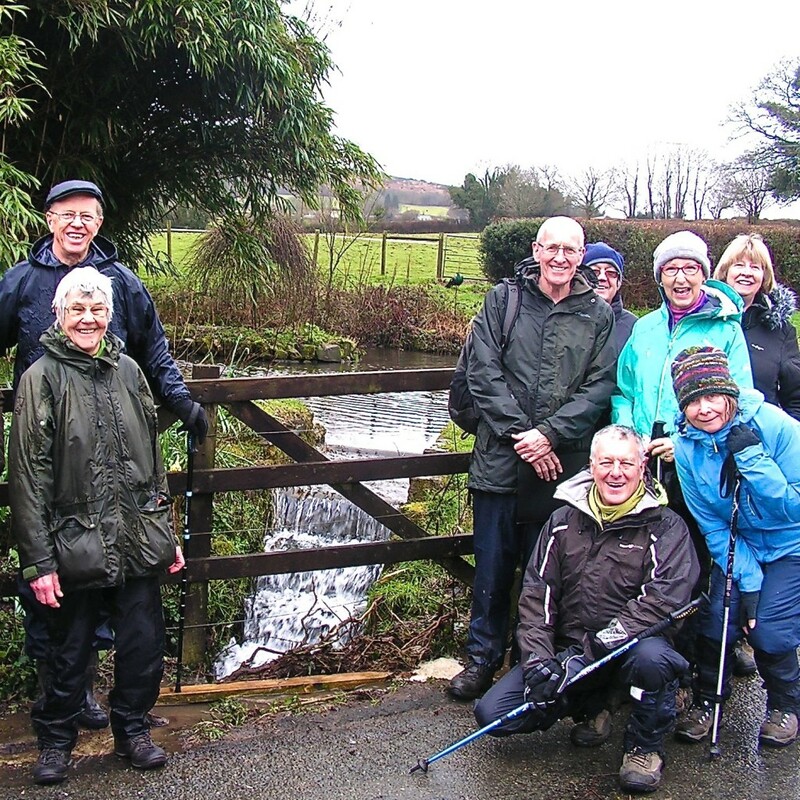 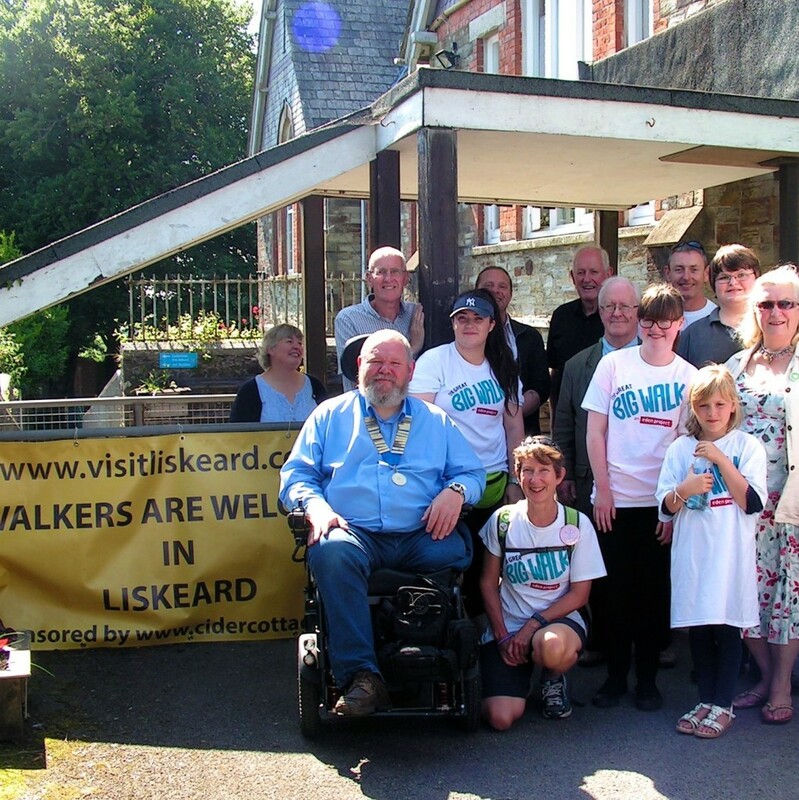 Liskeard’s Walkers are Welcome has been celebrating 10 years since the national scheme started. 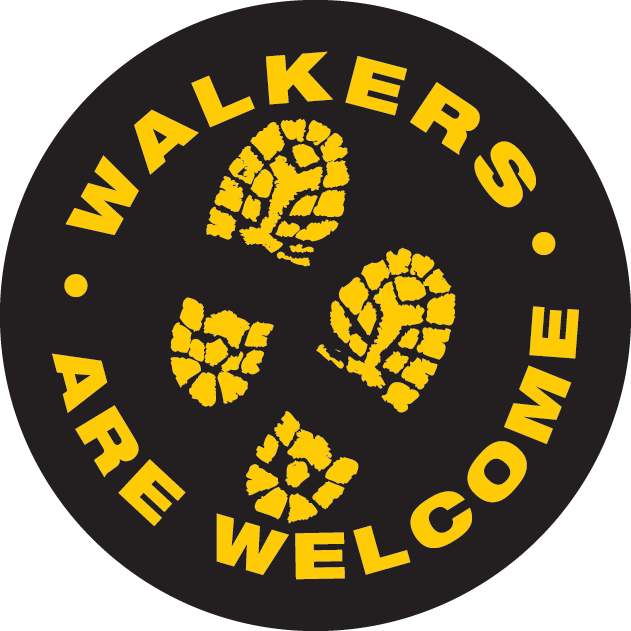 Over the past decade a network of 111 Walkers are Welcome towns have helped to develop 1,200 walks totaling more than 6,300 miles. 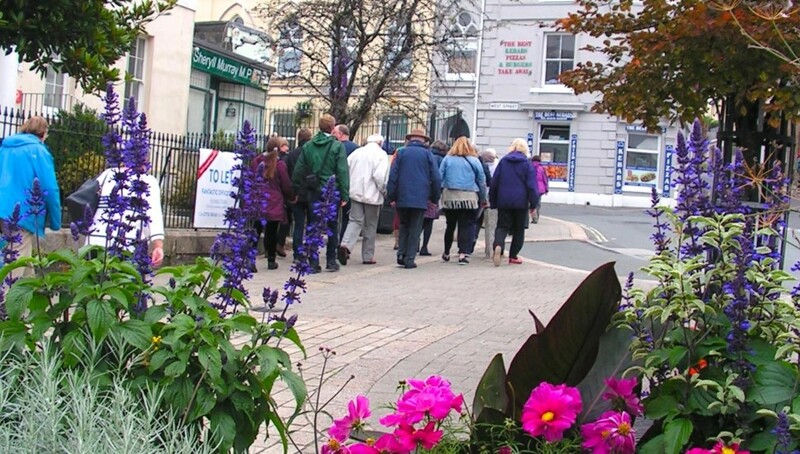 The scheme has also helped raise money for the participating towns’ local economies by encouraging footfall and enhancing vitality as well as promoting the positive benefits of walking. 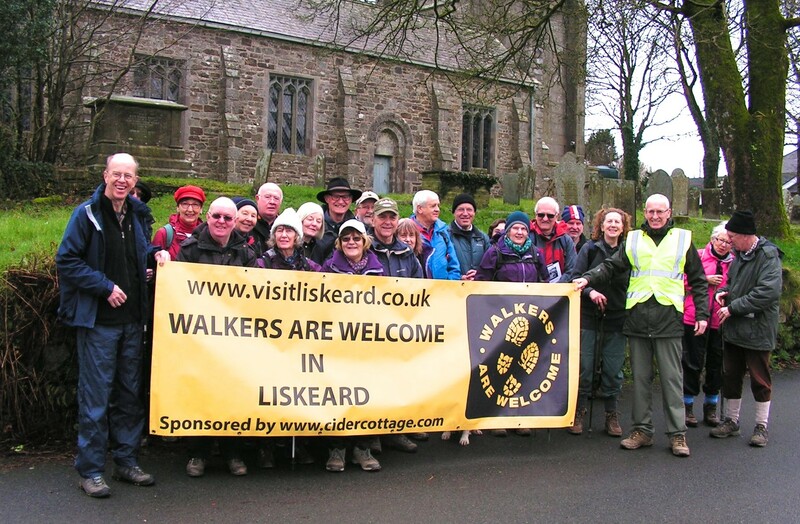 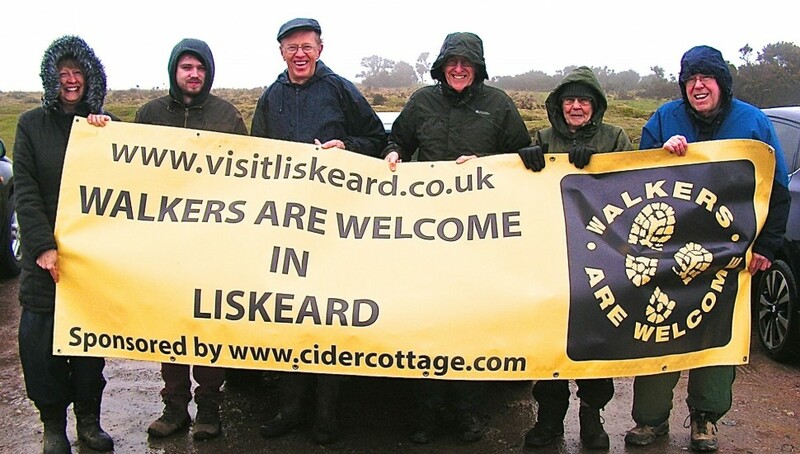 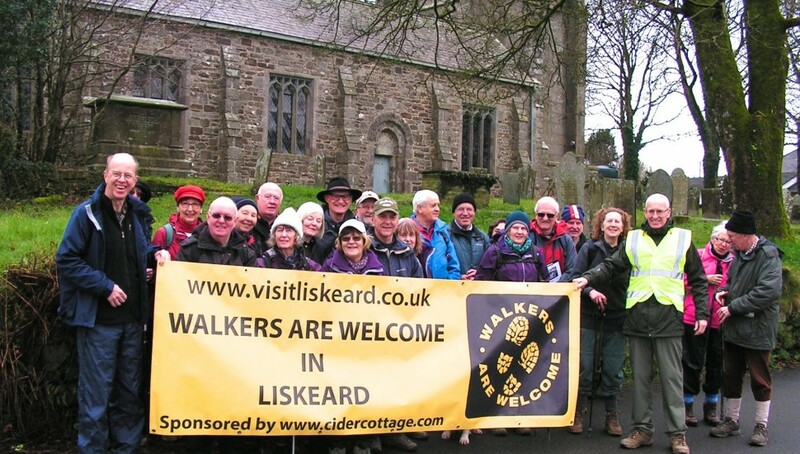 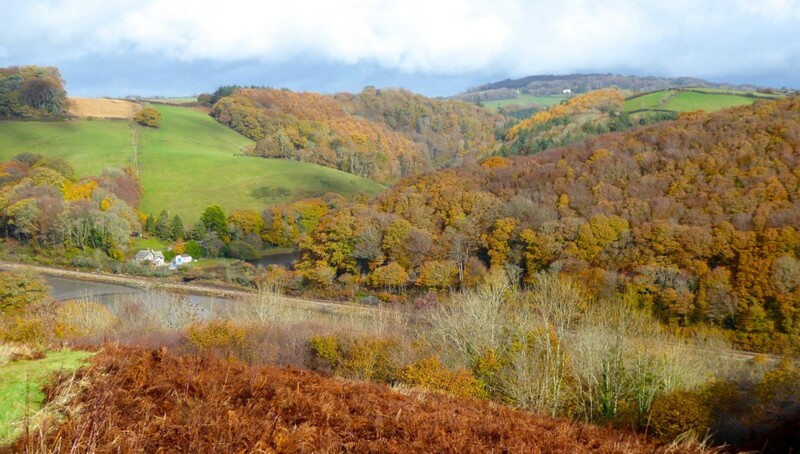 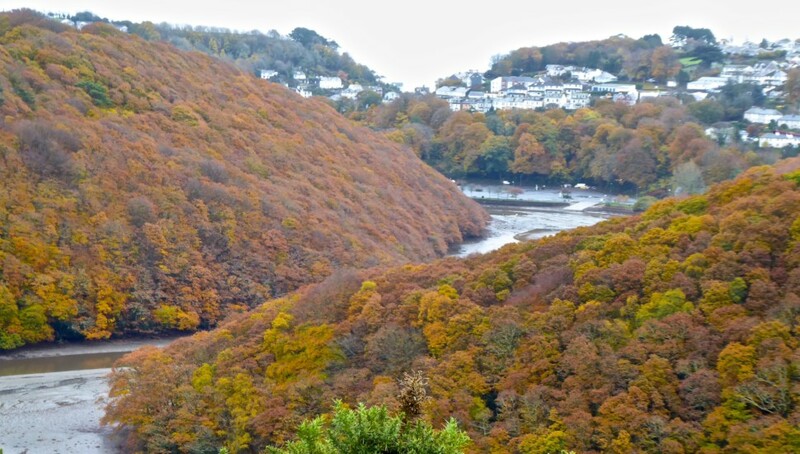 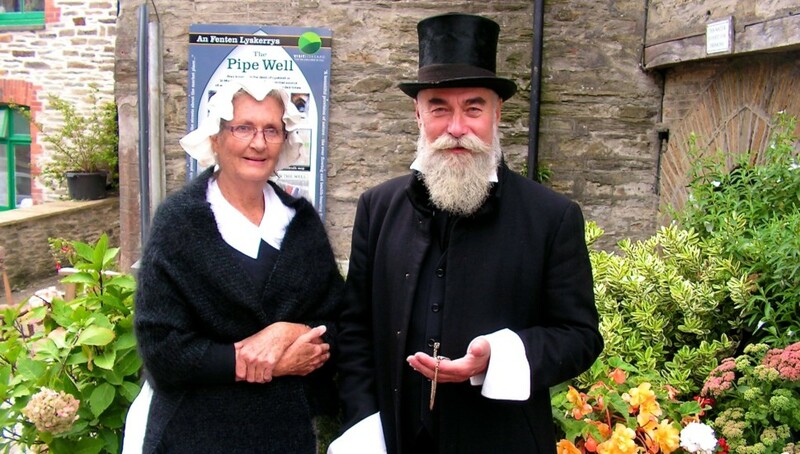 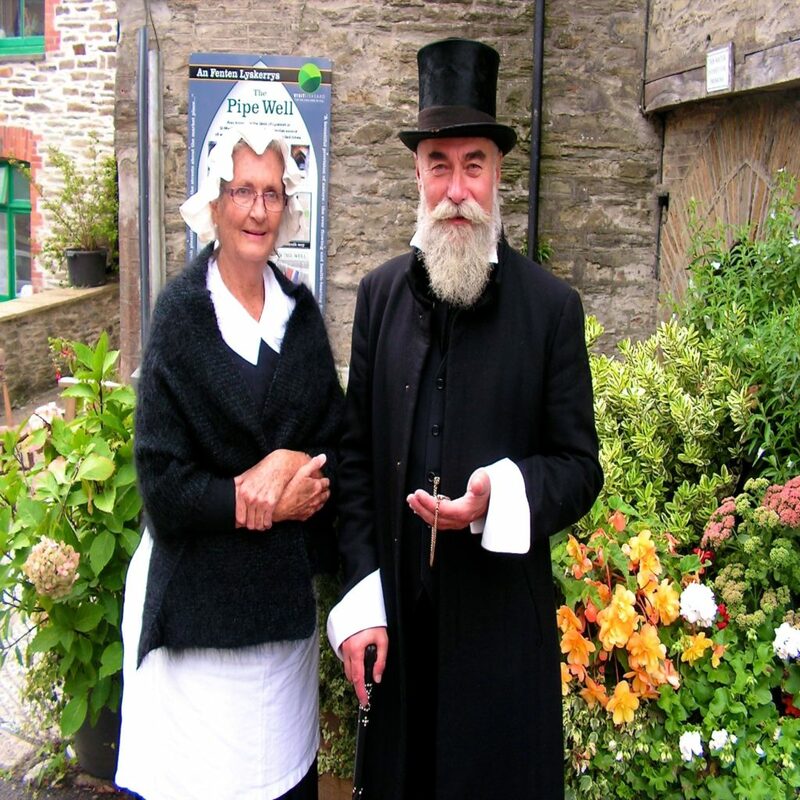 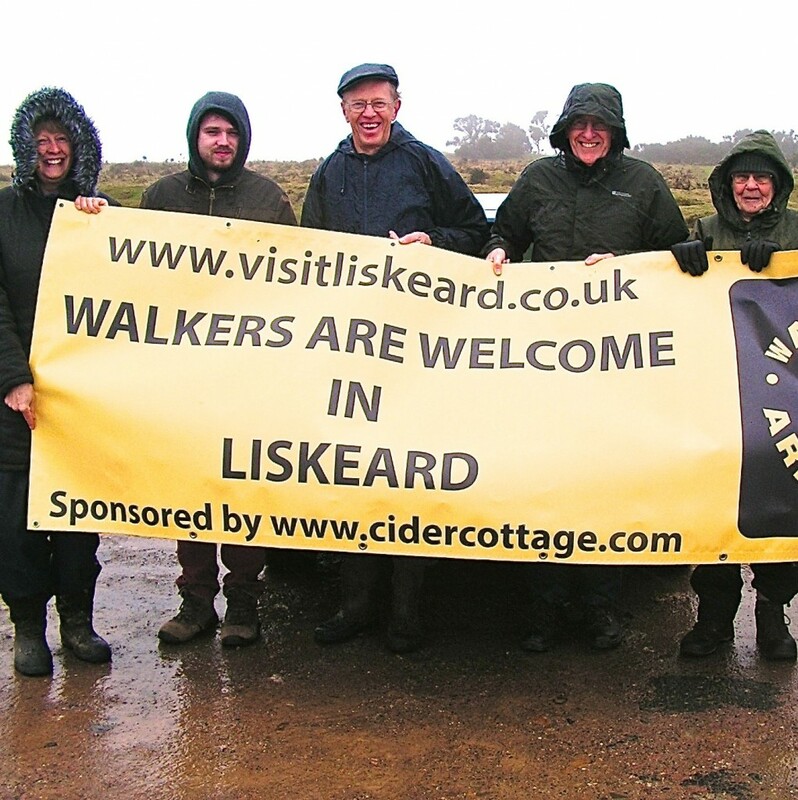 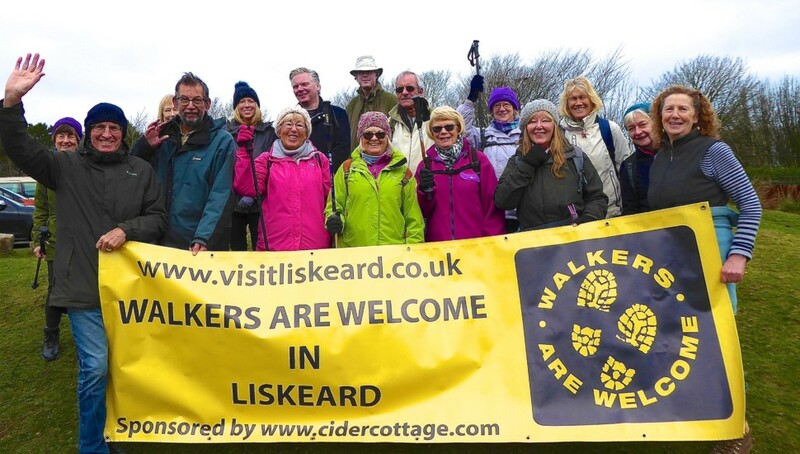 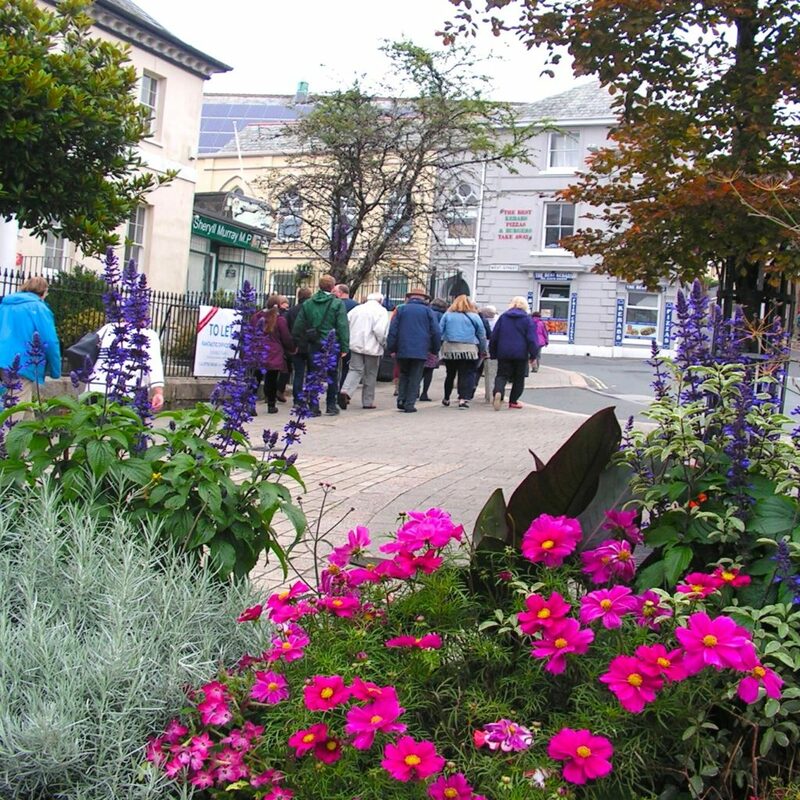 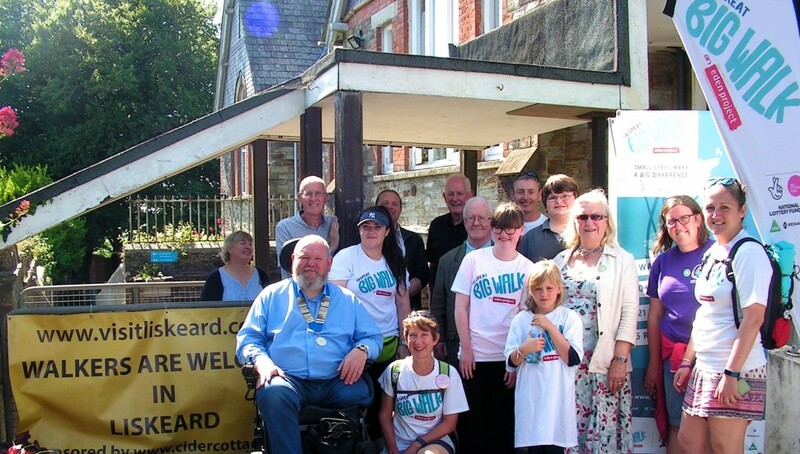 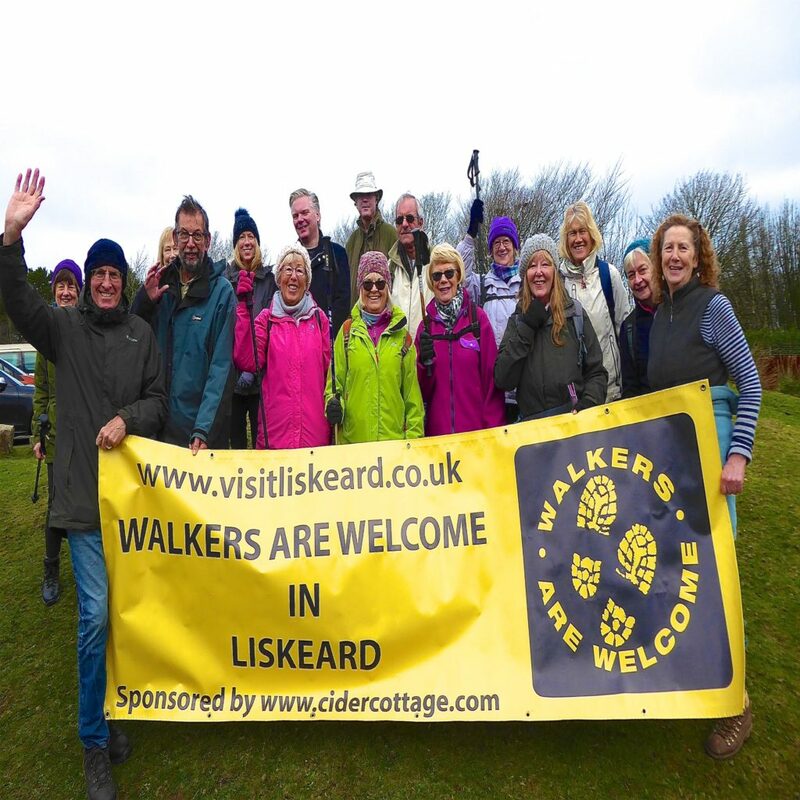 In Liskeard a Walkers are Welcome scheme was established in 2011, with the group continuing to encourage local people and visitors to discover and enjoy both the townscape and surrounding countryside and heritage attractions. 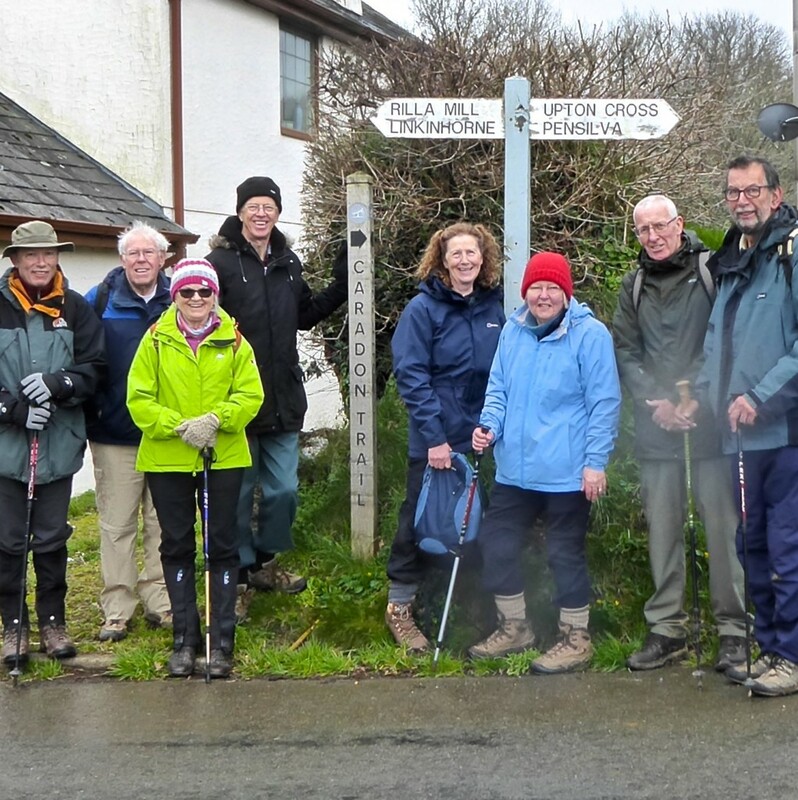 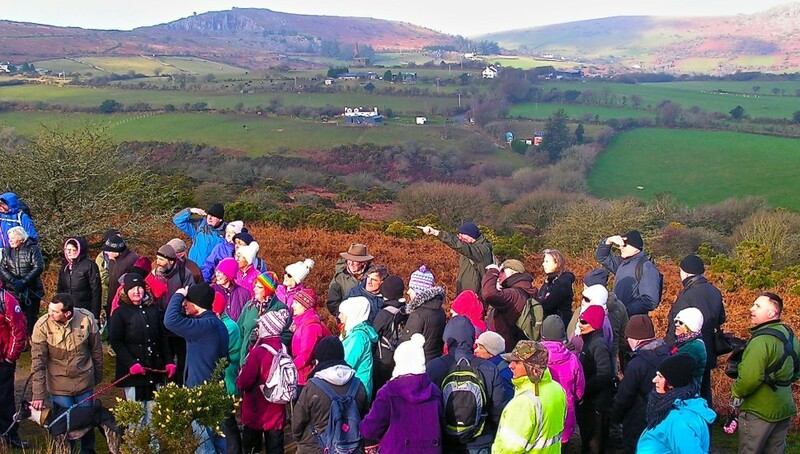 The accompanying photos show some of the groups activities over the past year including a wrap up warm walk on New Year’s day, Caradon Trail celebration, support for Jo Cox’s memorial Big Walk, Ladye Park pilgrimage, participation in the S.E. 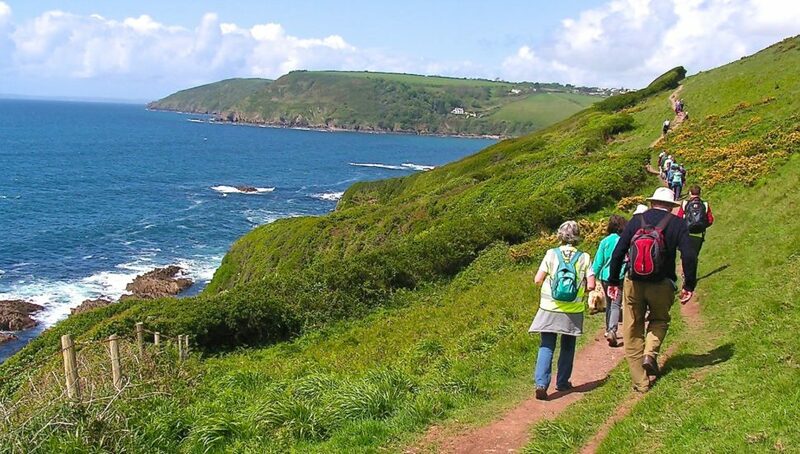 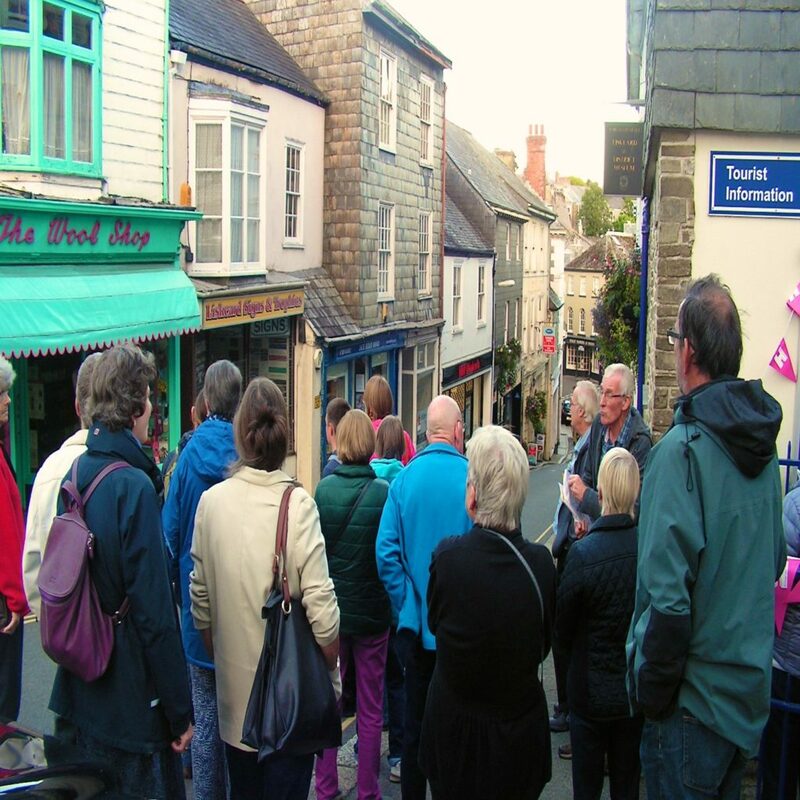 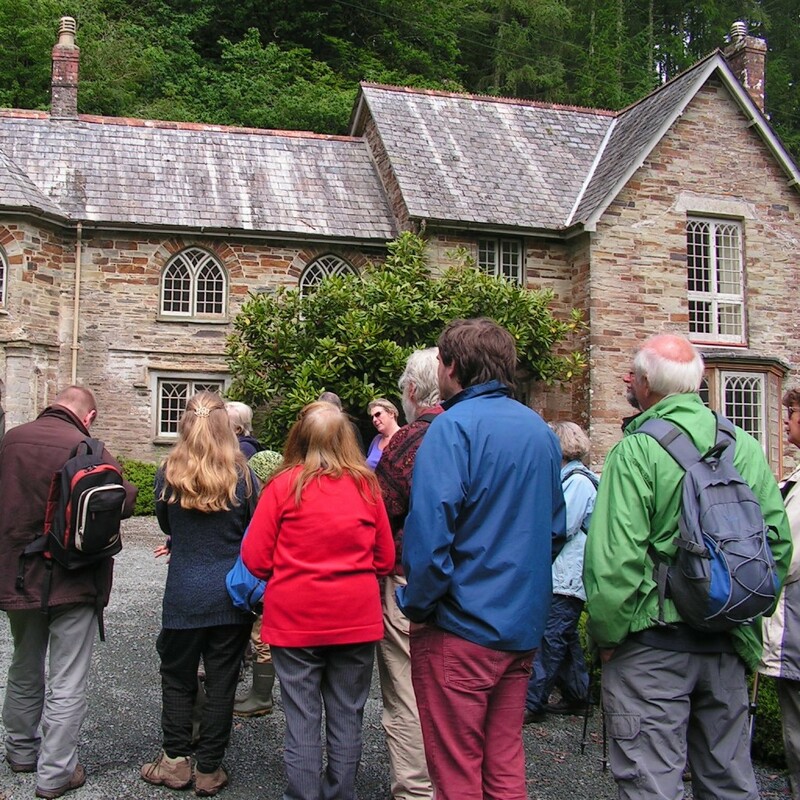 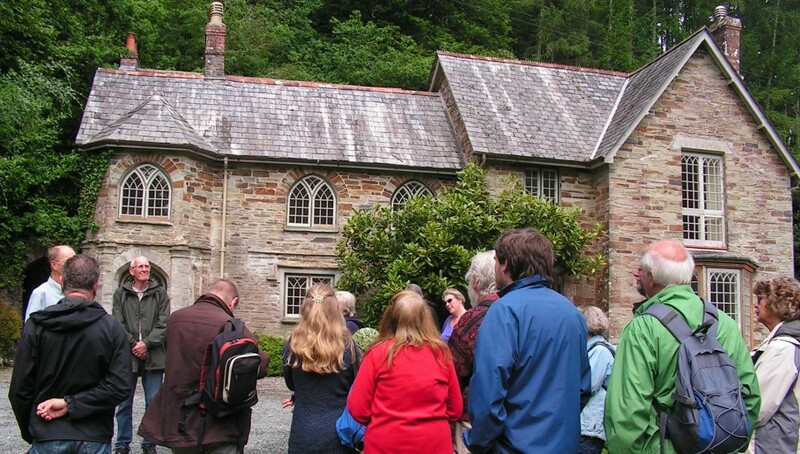 Cornwall walking festival as well as heritage walks around the town.